I do my best to keep a good stock of the latest high-tech gadgets. But yesterdays latest toy is out of date today and worth less than when it was new. 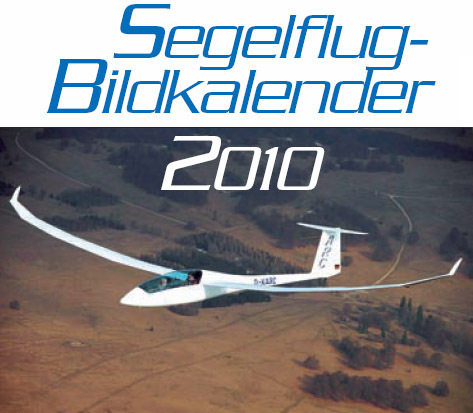 The page includes a combination of new but slightly out of date items and a used items. My plan is to keep reducing the prices on this page until all the items sell. The items will sell to the first person that orders them at the listed price. Please don't contact me with offers. The longer you wait, the lower the prices, but I have only 1 or 2 of most items - so if you wait too long someone will buy the item you are interested in before you. The items on this page are all units in my stock. When they are sold the price is no longer available. I cannot order additional units for sale at these liquidation prices. I have purchased a few of these classic and valuable Pocket PCs from customers that traded up to other devices. 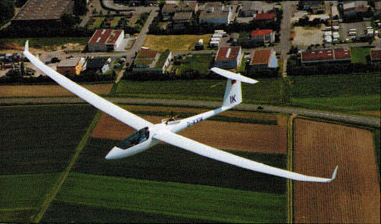 Many glider pilots still love this old PDA because its black and white display is easier to read in sunlight than newer color PDAs. 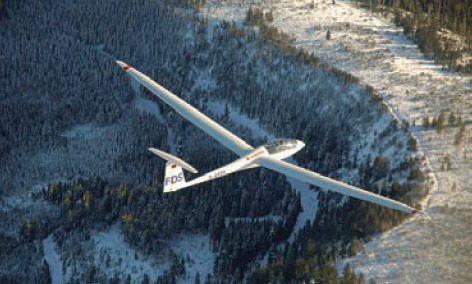 Glide Navigator II soaring flight software runs great on it. 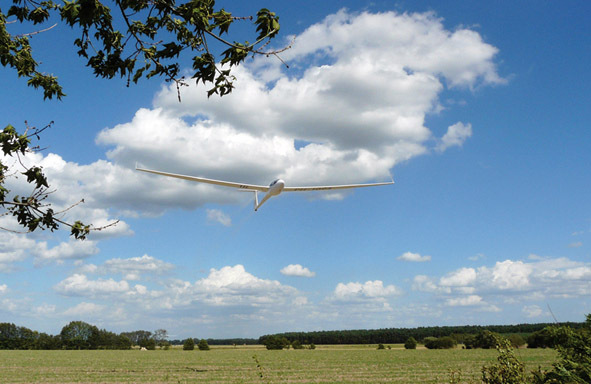 All the units have been thoroughly tested and approved by Cumulus Soaring, Inc.
Let me know if you have any good, used power/data cables or cradles for the Compaq Aero 1500 PDAs. I need any I can find because the power/data connectors used in the cables are no longer available. 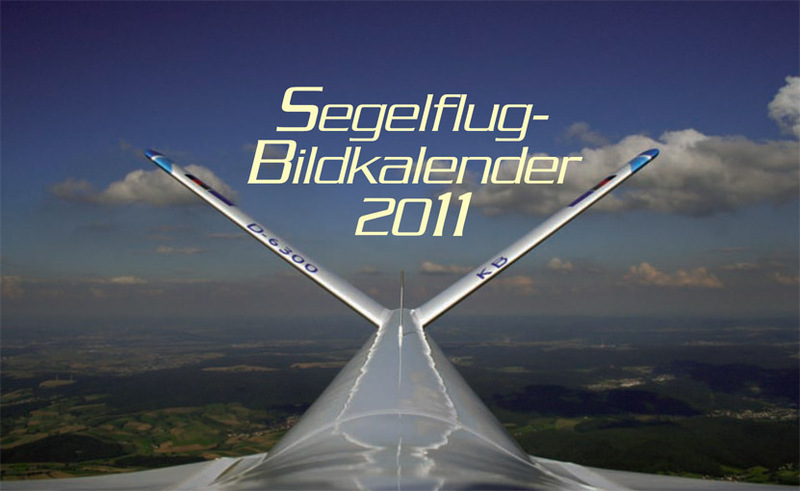 The Segelful-Bildkalender offers fantastic soaring photos in a large format. 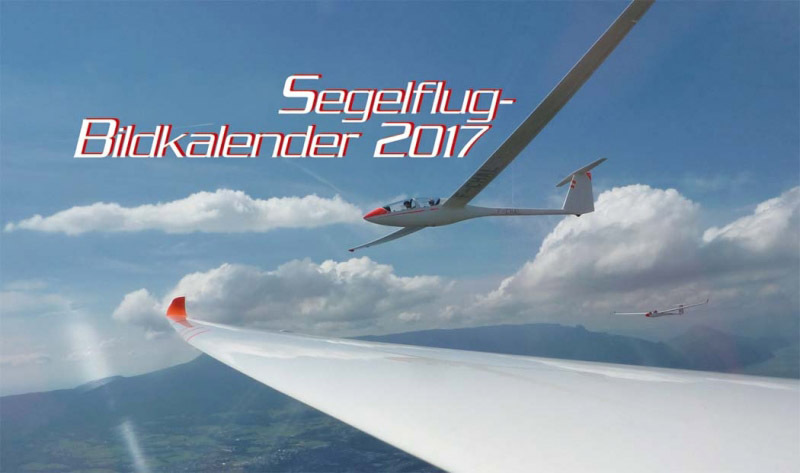 Suggestion: Add a 2017, 2014, 2013, 2012, 2011, or 2010 Segelful-Bildkalender to your order for only $10. 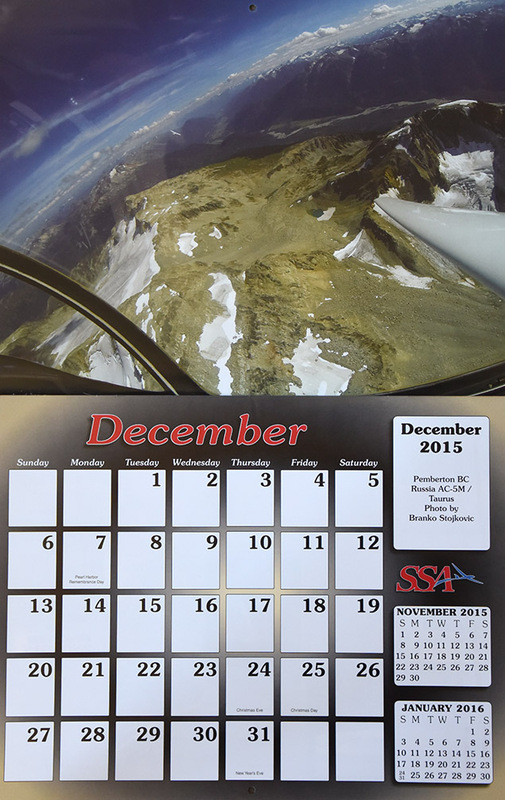 They're out of date, but the very large photos make great posters - the calendar tab is perforated for easy removal. 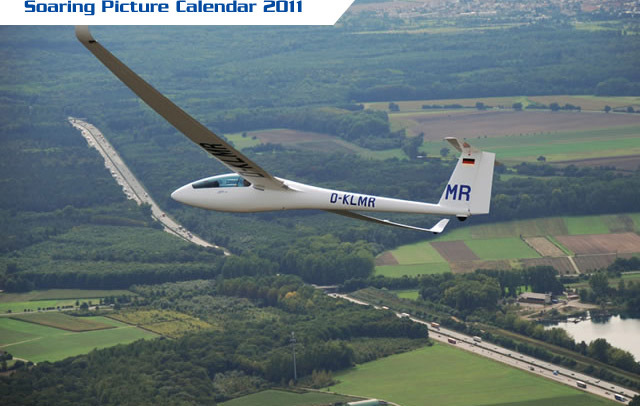 With 13 brilliant shots, fascinating motifs, high-quality workmanship and great stories and reports are our maxim for the new gliding picture calendar. 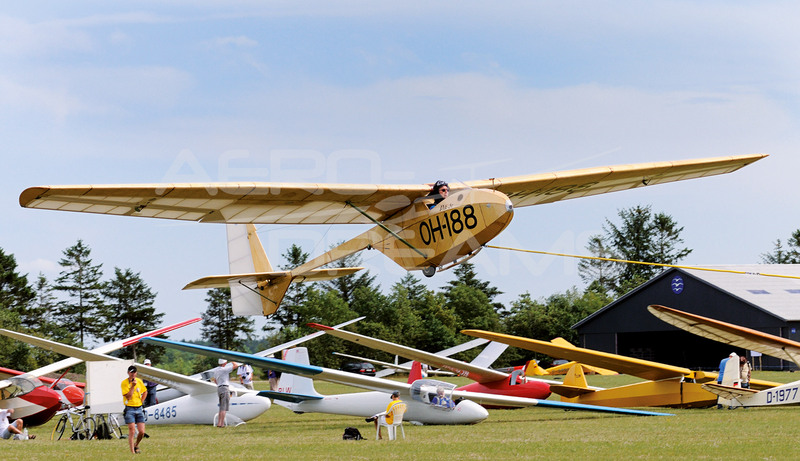 The 49th edition presents a selection of diverse aircraft types and famous vintage cars. 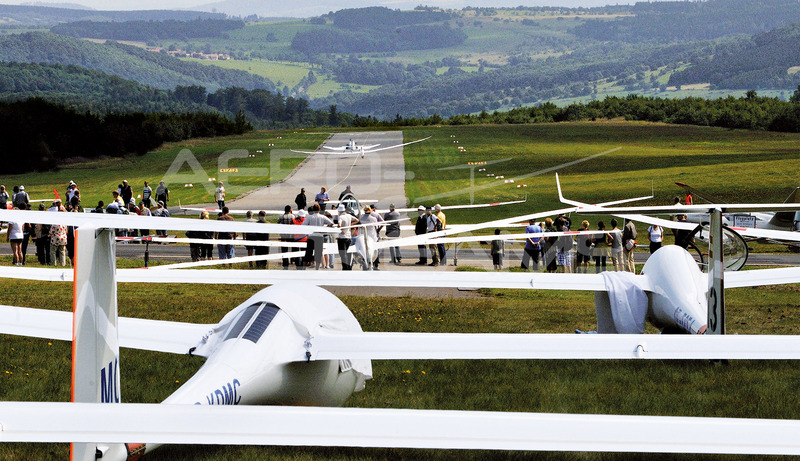 In an "orchid" with a span of 28 meters, the season is opened in a training camp in Vinon. 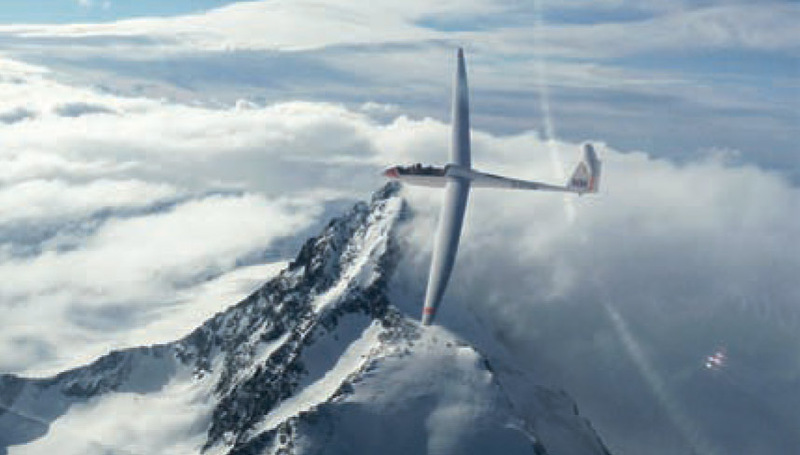 The perfect wave "on top" found an LS7 and an ASW 20 in 2,500 MSL in the Alps. 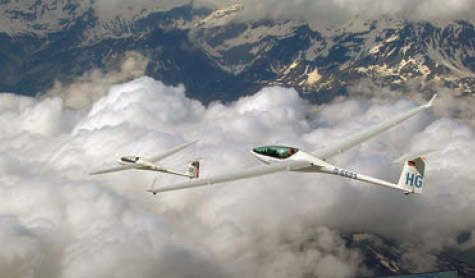 Two completely different double-seaters are used in the Austrian Alps for the higher school of gliding. 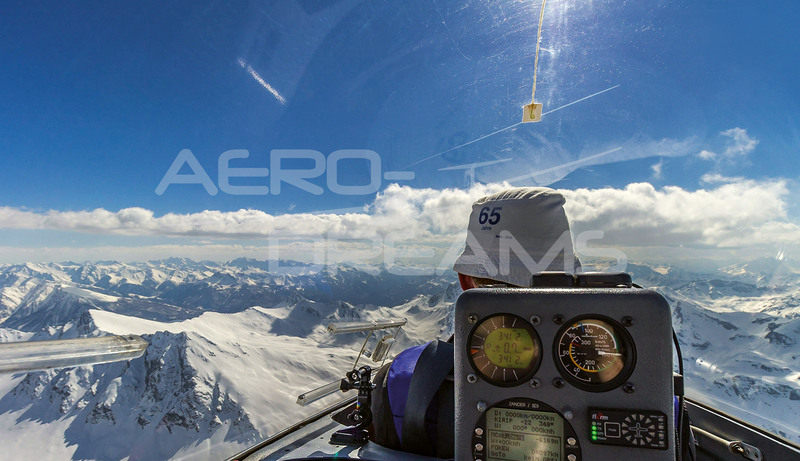 Thermals up to 4000 meters and visibility to the horizon had an Arcus-T in the French mountains near Gap. 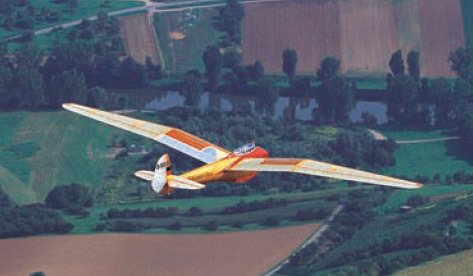 The restoration of a PIK 5 from 1946 took 10 years. 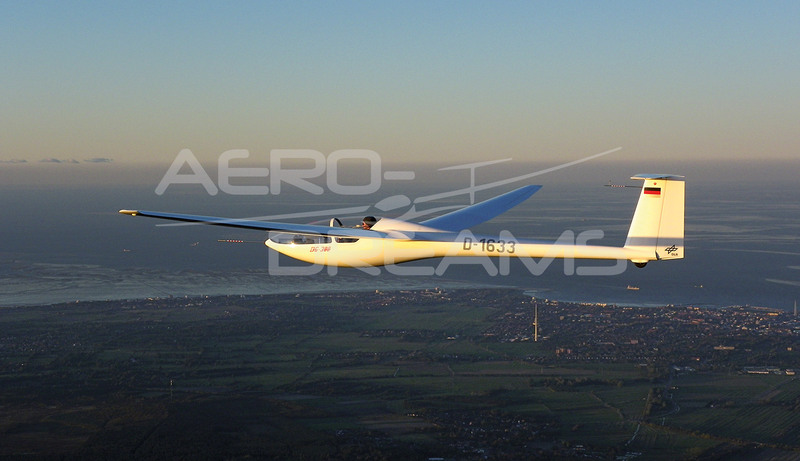 There are only 3 airworthy specimens of the DFS Habicht E worldwide, we introduce one. 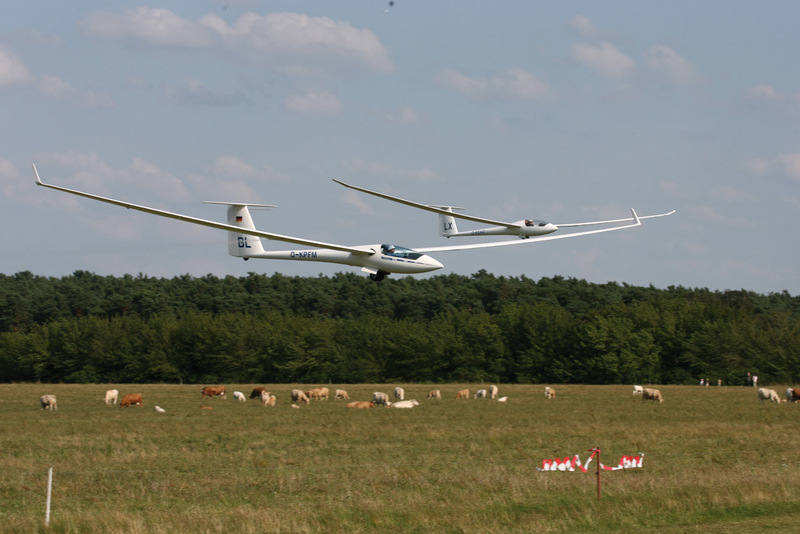 Do you want to know how 10,000 kilometers of track came together, what a surveying glider serves and much more? 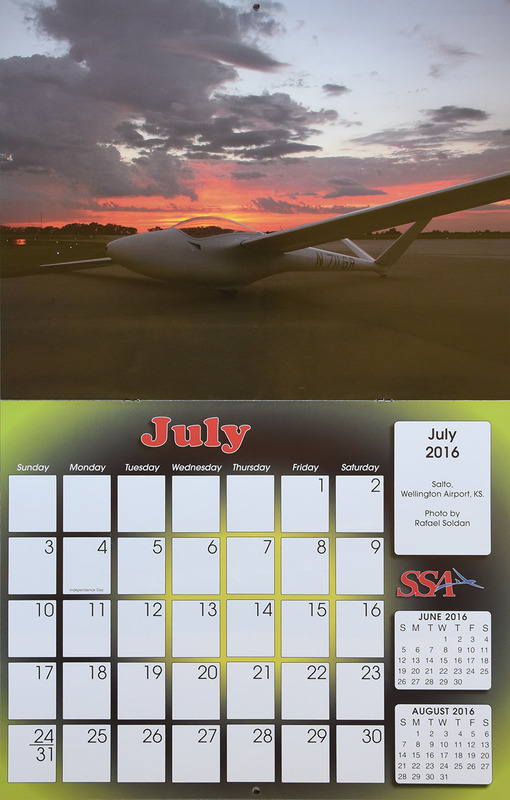 This calendar offers extremely well written and interesting information on the back of each photo. 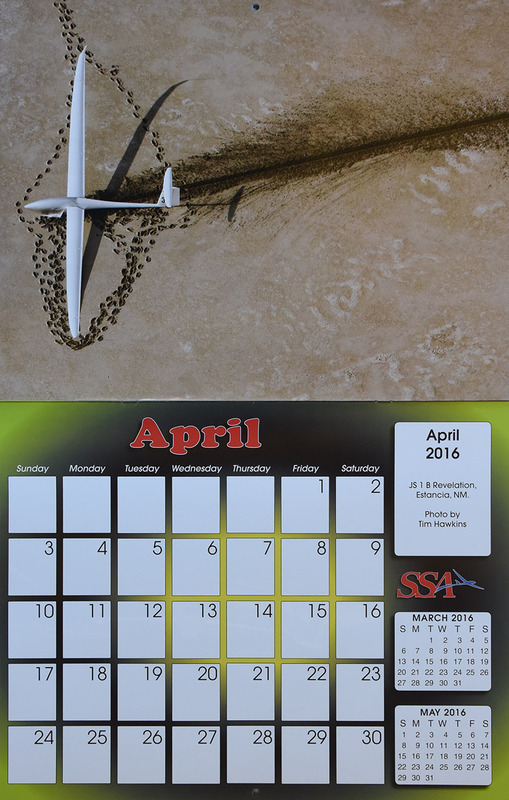 It makes this calendar really stand out from all others. 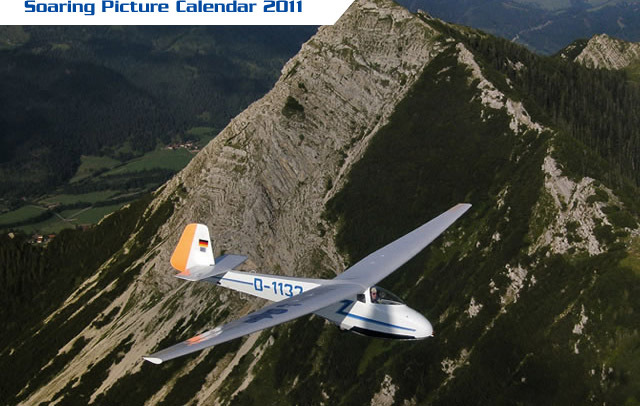 Note: This calendar includes a very basic calendar. 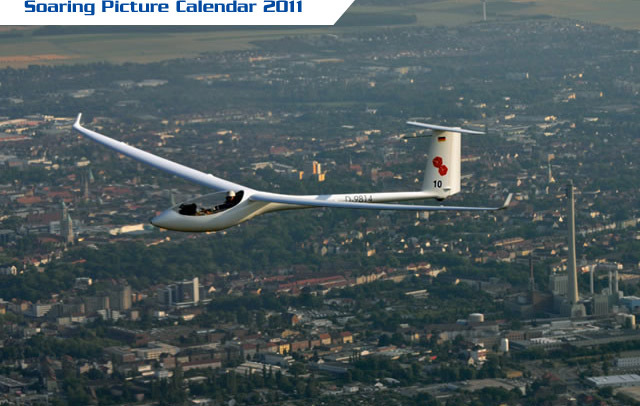 It does not have a large grid of days that can be used to write appointments or notes. 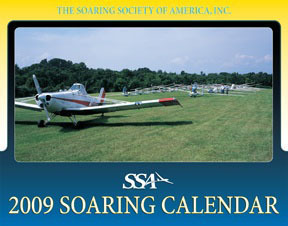 The SSA Soaring Calendar is more suited to use writing notes on specific dates. 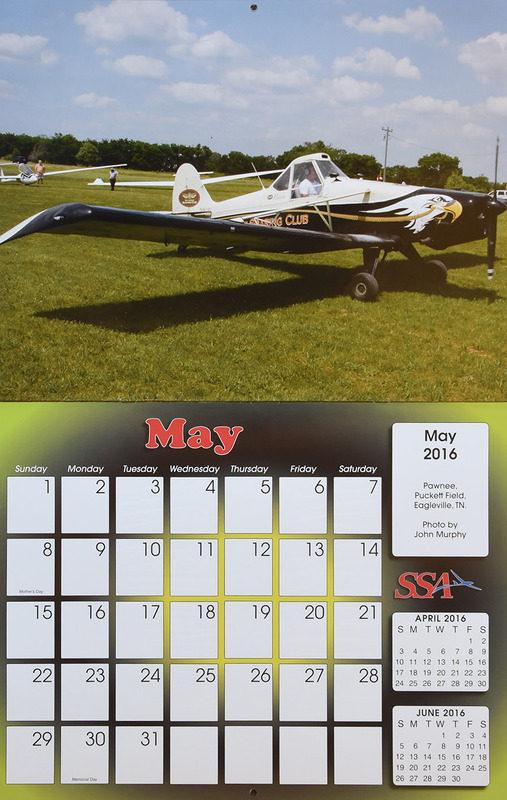 But this calendar's large photos look great on the wall of your office or soaring club clubhouse. Click on the images above to view larger versions. 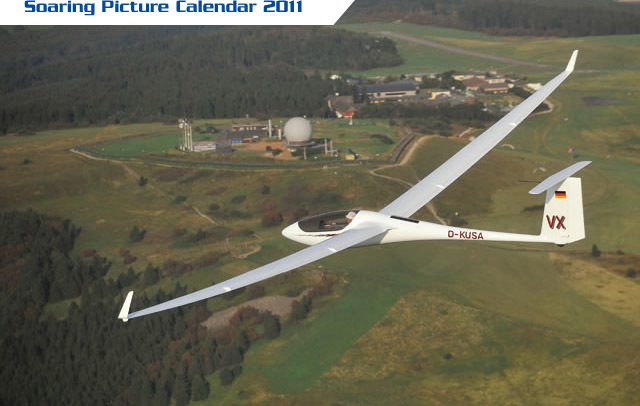 NOTE: The "Aero Dreams" logo will not be on the printed calendar pages. 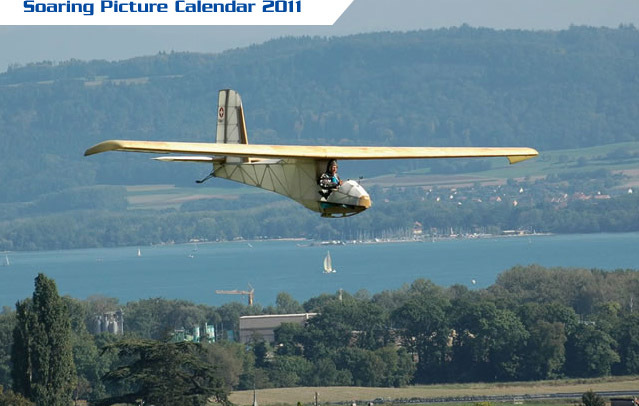 Note: These calendars are somewhat out of date, but the photos are still awesome. 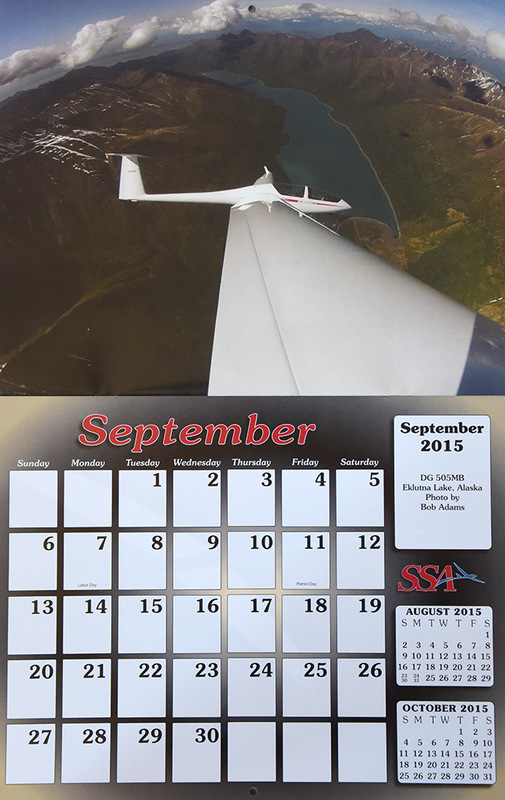 The calendar data is at the bottom of every page that is perforated so that it can be removed easily. I have just a few of these remaining in stock. 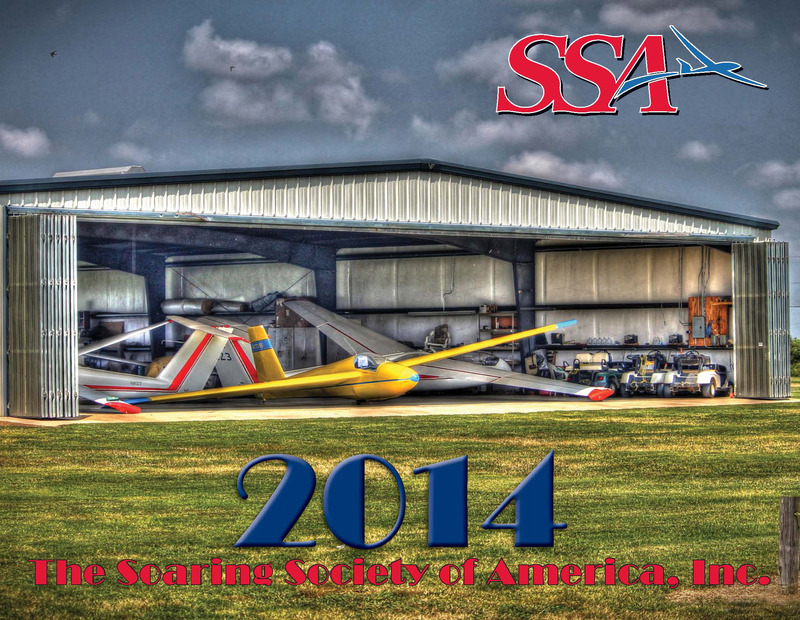 $10 is a great deal for 13 very nice soaring posters. 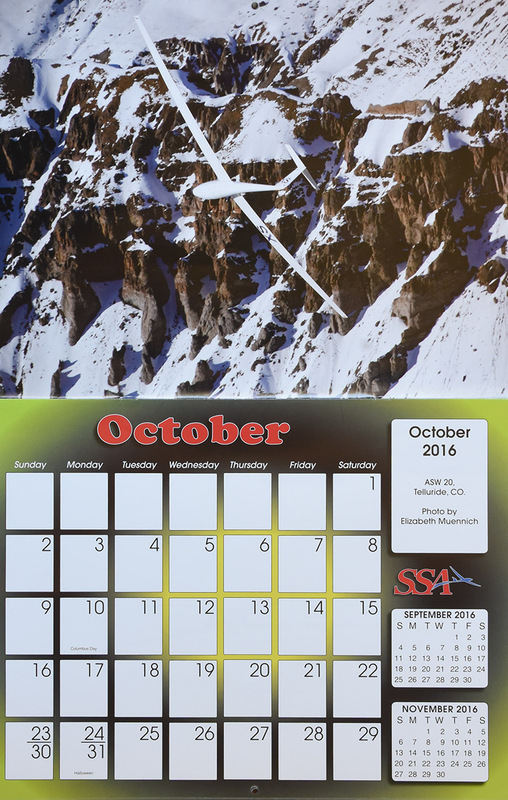 This 44th edition of the Soaring Calendar has 13 brilliant color photos and captures the fascination and aesthetics of this wonderful sport. The reverse of each page bears further details about the how, where and when of the picture; for example: the "Adventure Sailplane" - agile in the air, and convenient on the ground; nine months' preparation for the World Championships; a Winter Dream ; the ASW 27 B - the long-distance runner. 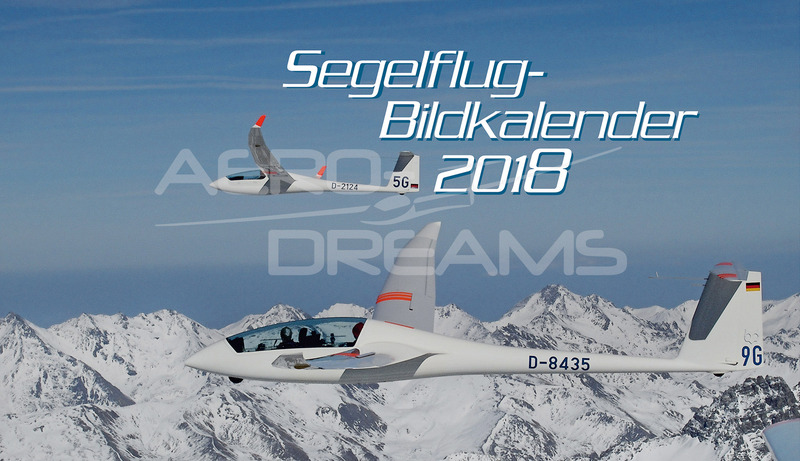 Another page tells of the further development of the Akaflieg Braunschweig SB 10. 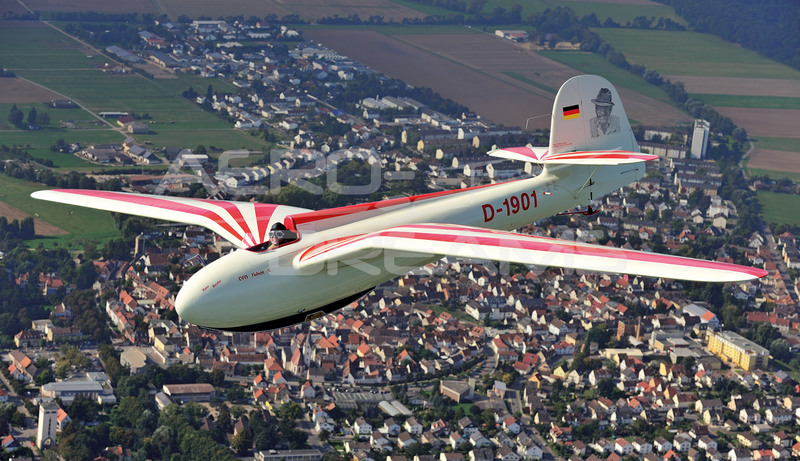 Also the first flight of Cumulus III f D-6059, nearly 60 years ago. We may not have been there at the time, but know what happened next. 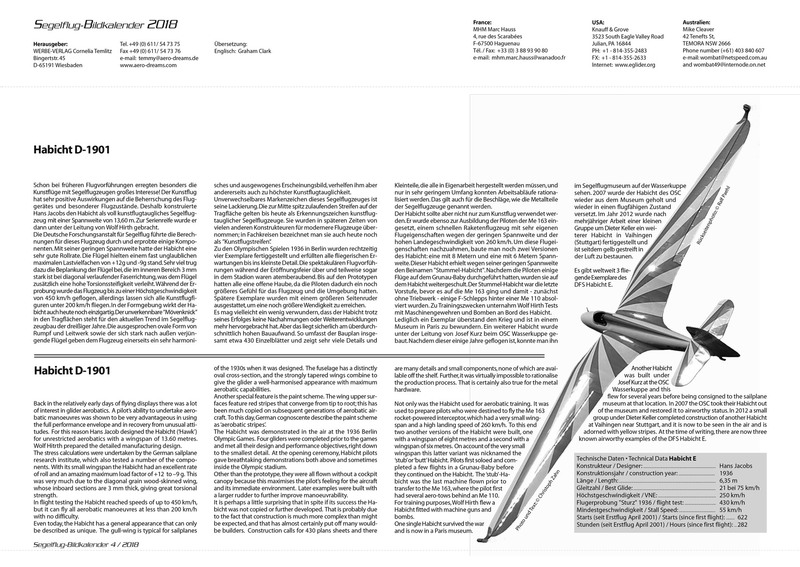 And there are other surprises; in large format 48 x 29 cm (18.9 x 11.4 inches) and the folding monthly dateline. 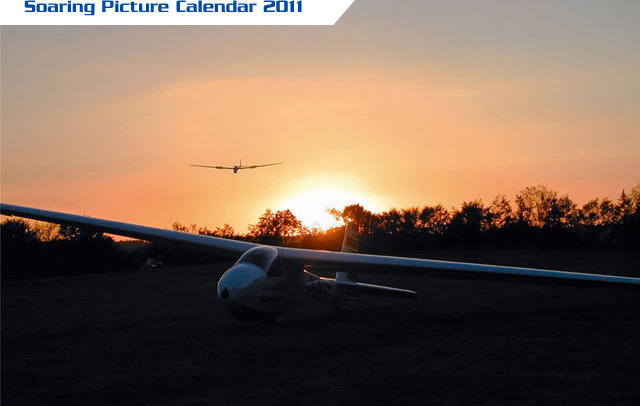 Note: These calendars are out of date, but the photos are still awesome. 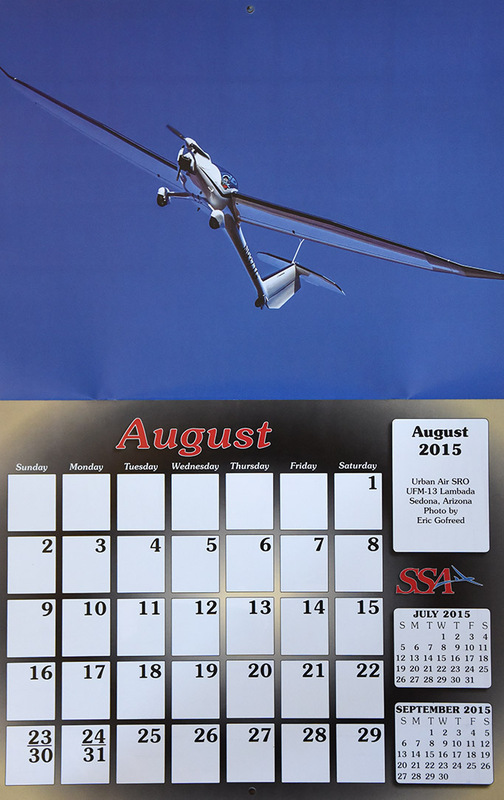 The calendar data is at the bottom of every page that is perforated so that it can be removed easily. I have just a few of these remaining in stock. 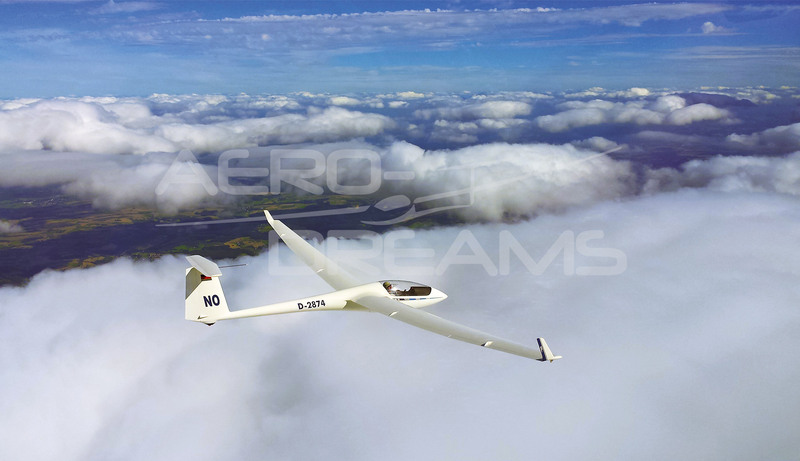 $10 is a great deal for 13 very nice soaring posters. 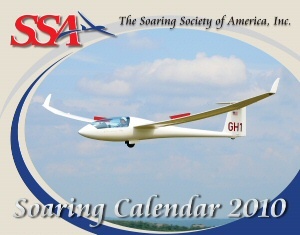 Once again, the annual soaring calendar features 14 fantastic color photographs revealing the dynamism and beauty of soaring flight. The is the 43rd edition of our popular yearly publication, with related stories printed in English, German and French. 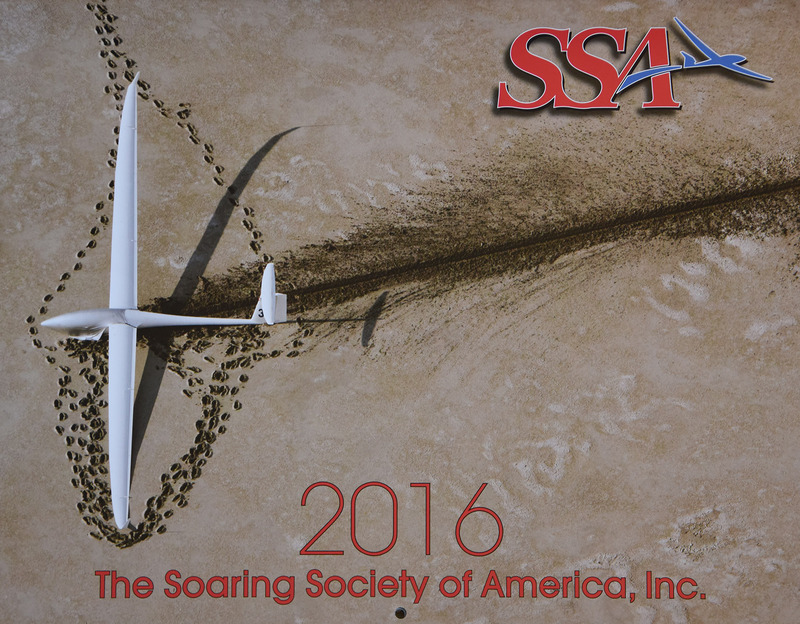 This year's subjects include: solar-power; the latest in small jet engines; the safety factor of sustaining motors; and modern instrumentation. 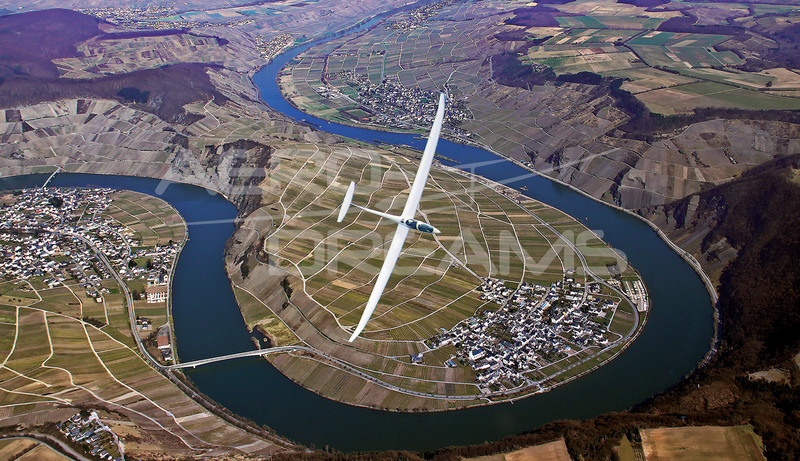 Our photographers guide us along the Pyrenees mountains, ride wave lift above Germany's Black Forest, and soaring over southern Australia. 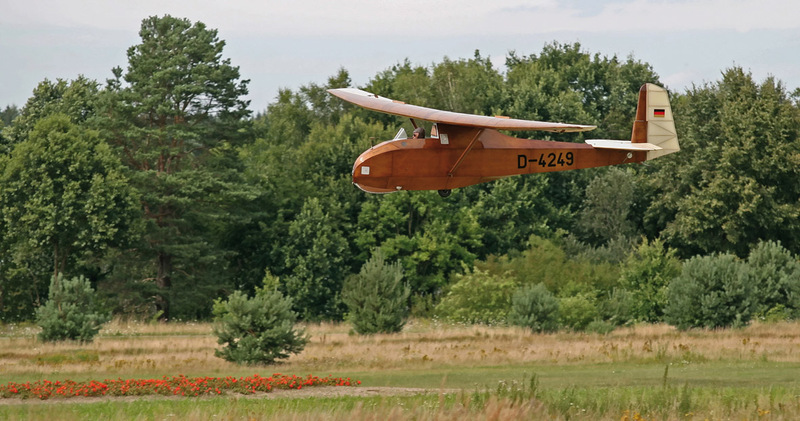 The beautiful wood of the Grunau Baby III is a photogenic counterbalance to plastic. Have you ever heard the story of the Baba Jaga? If not, try and get a hold of a copy. 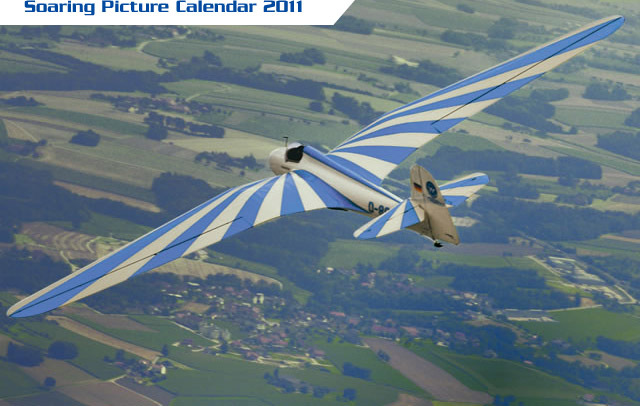 Once again, the unique soaring calendar is spine-bound in a unique large-format of 48 x 29 cm (18.9 x 11.4 in). 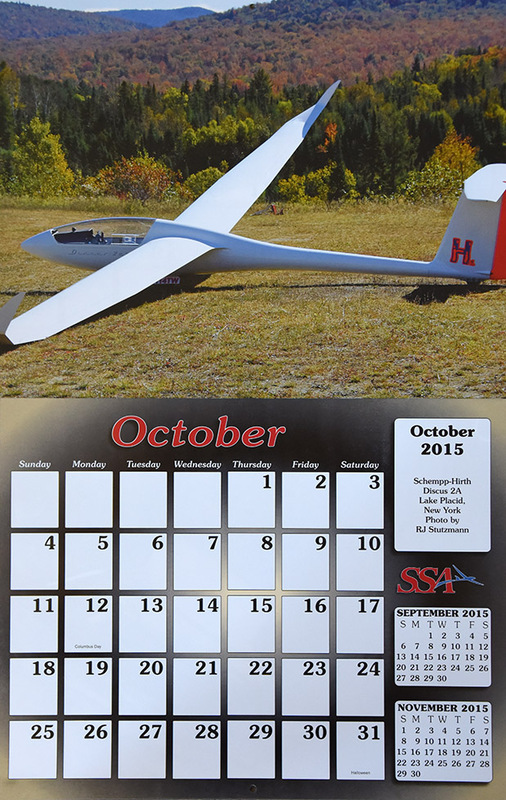 My favorite photo from this year's calendar is the one of the Schempp-Hirth Arcus E electric-powered sailplane. 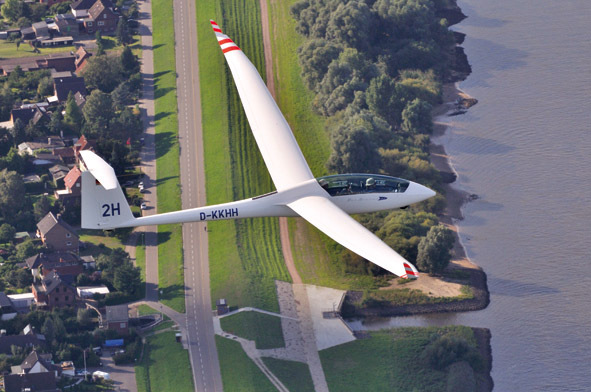 What a lovely glider - with an elegant, clean powerplant! 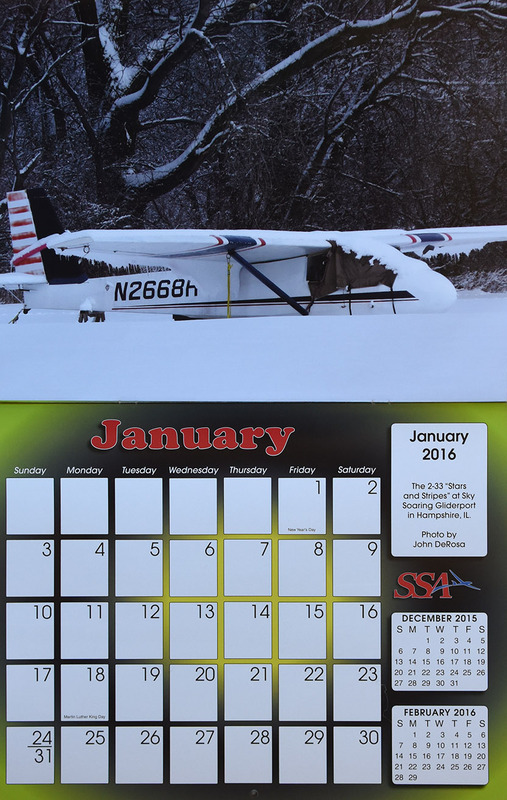 The 42nd issue of our internationally popular wall calendar has 13 color photos revealing the fascination and beauty of soaring flight. 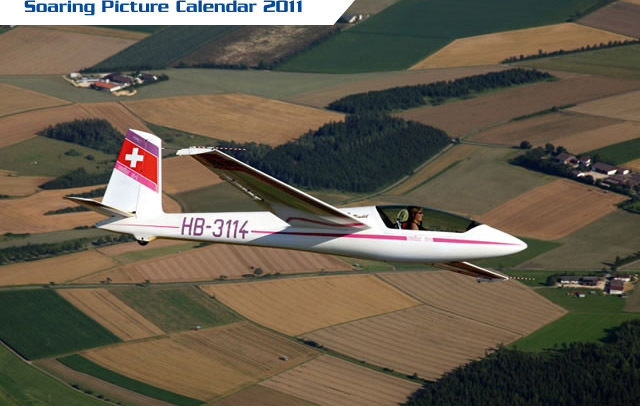 The rear face of each page bears a description in English, German and French. 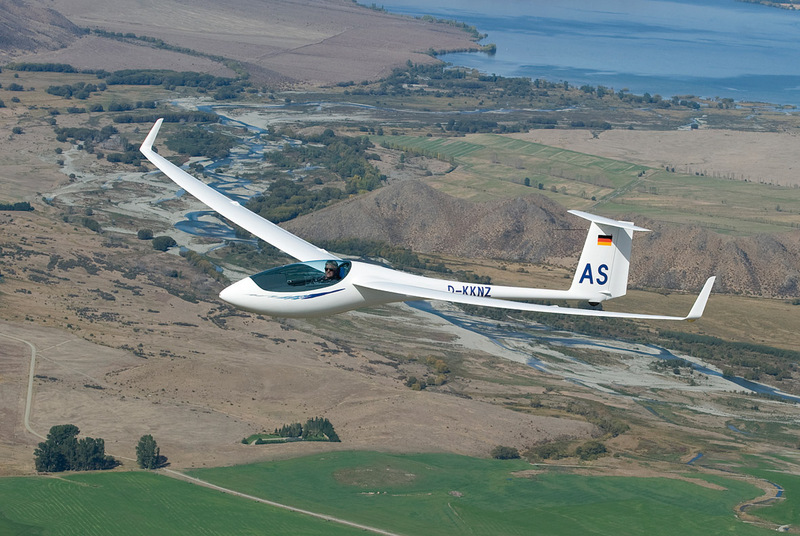 Subjects include the very latest sailplanes under test, popular vintage and veteran gliders such as the L-Spatz III and OSV bungee launching, coastal soaring, circumnavigating Cologne in an ASW 15b, plus the story of the only woman flying in the Unlimited National Team. 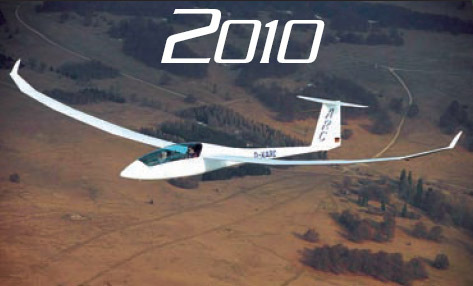 Do you know where the 2011 FAI World Sailplane Grand Prix Finale is to be held, and the anniversary commemoration date of Soaring’s most important event? 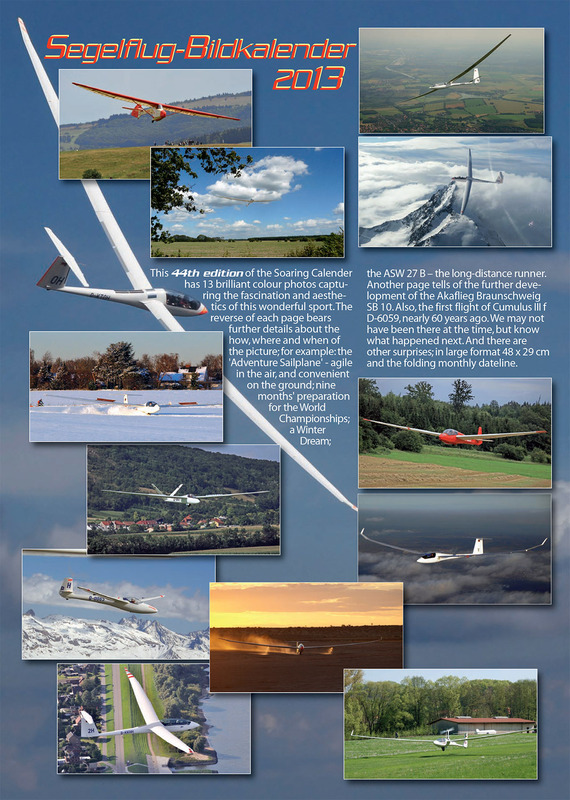 All this and more in the latest issue of the Soaring Picture Calendar; make sure of your copy and you will be up-to-date with coming events. 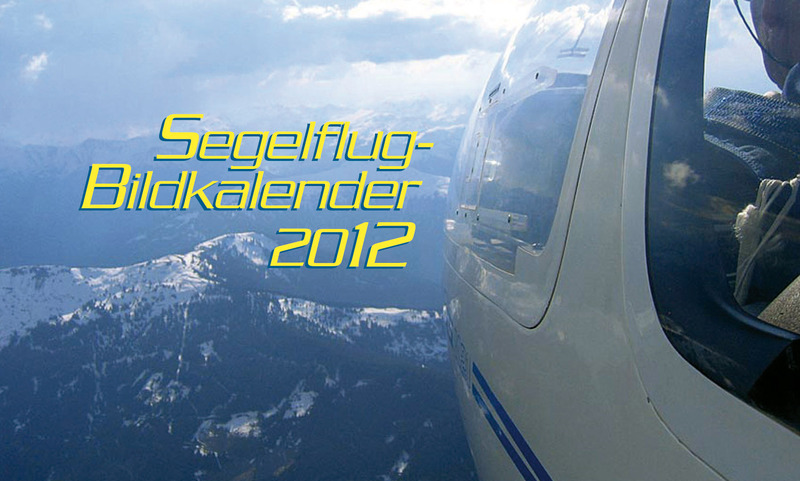 Produced in the popular wall format 48 x 29 cm with an unfolding weekday panel: this is a unique product – so order now! 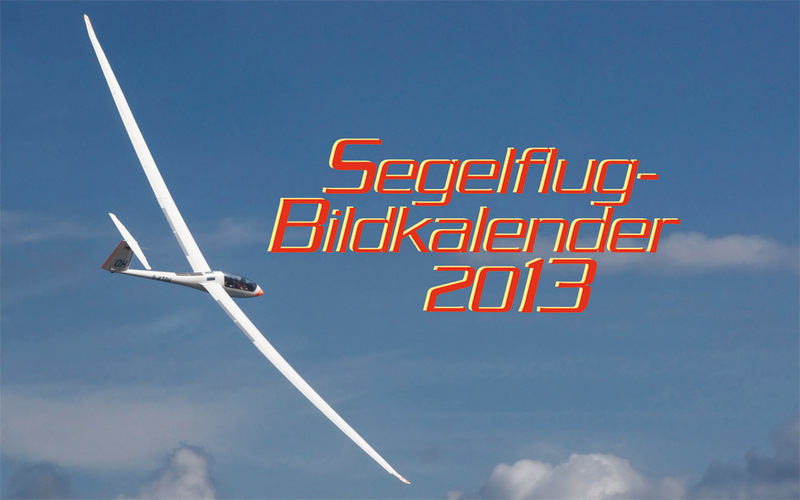 We are proud to present the 41st annual Segelflug-Bildkalender, with 13 fabulous color photos showing a wide range of beautiful sailplanes and landscapes. 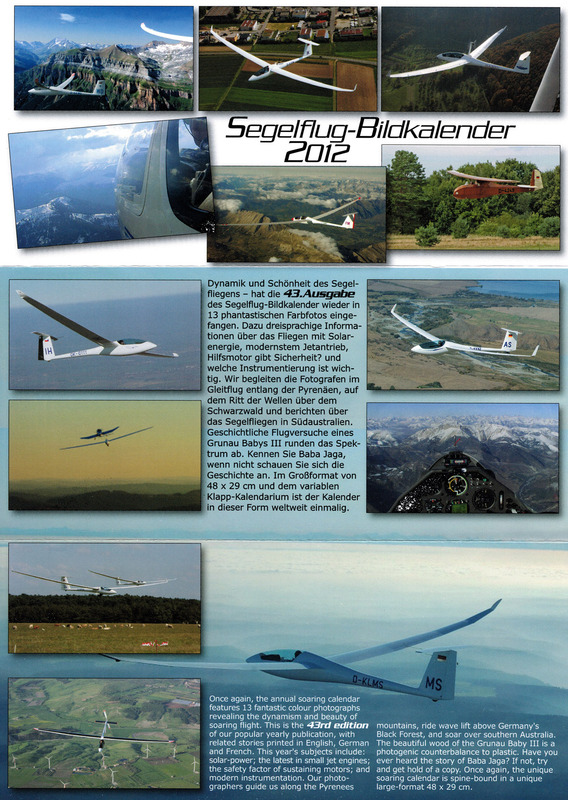 The back of each monthly page has an extended description in English, French and German. 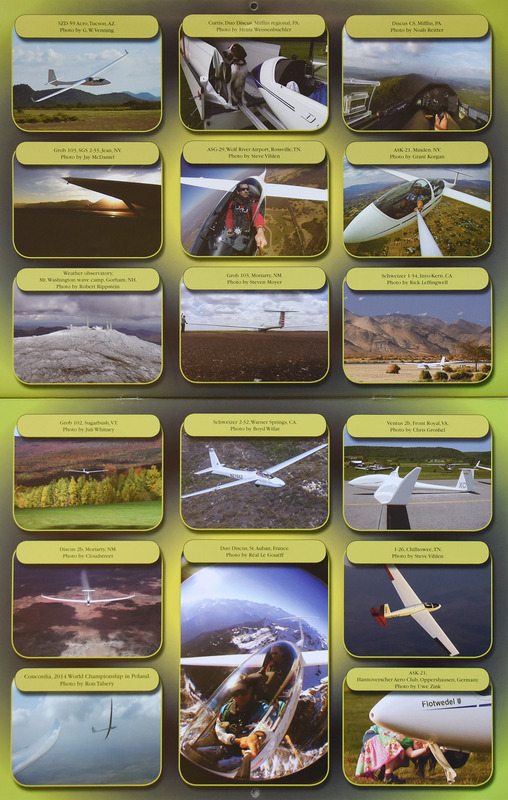 Subjects include the very newest sailplanes, "jet-flying made easy", much-loved vintage and veteran gliders, flying over the Mojave Desert, and historic early attempts at flight. 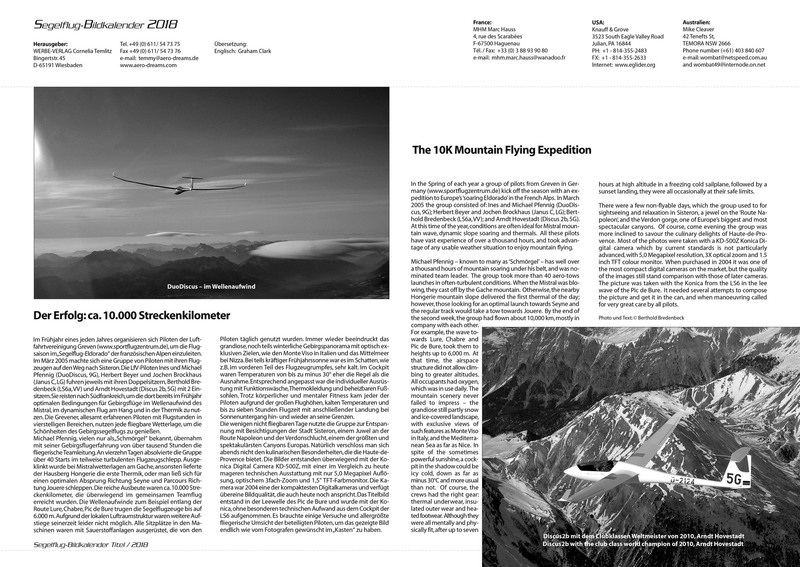 This exciting range of subjects is rounded off by: "Four generations of the same flying family" and "Hans Jacobs' Rhönsperber". 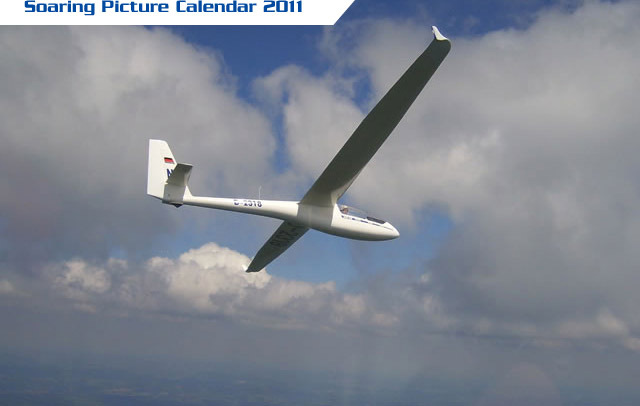 Each page is 48 x 29 cm (18.9 x 11.4 inches) with a fold-out monthly calendar panel. 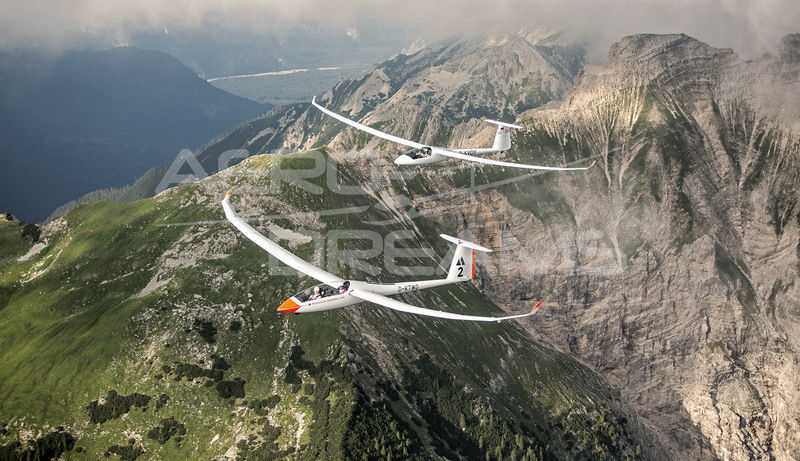 Sale: These are out of date, but the photos are still awesome. 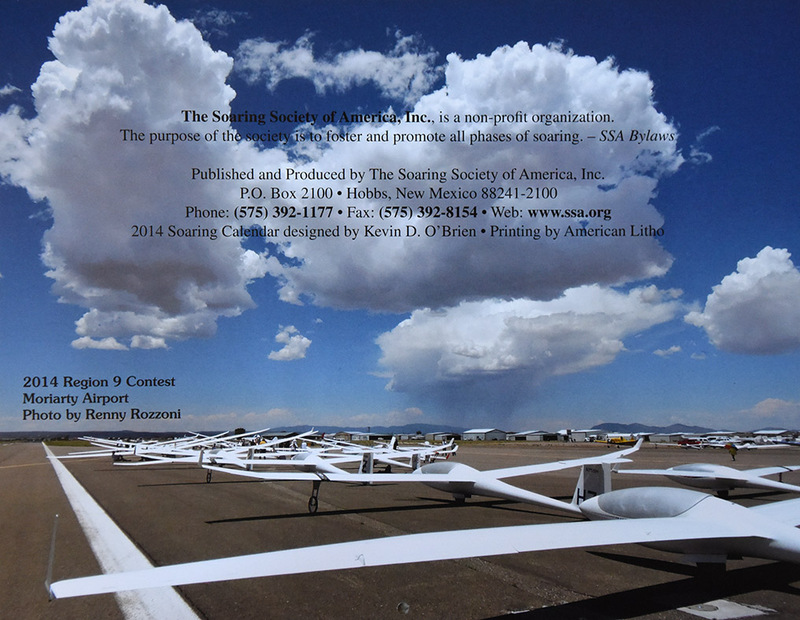 $5 is a great deal for 13 very nice soaring posters. 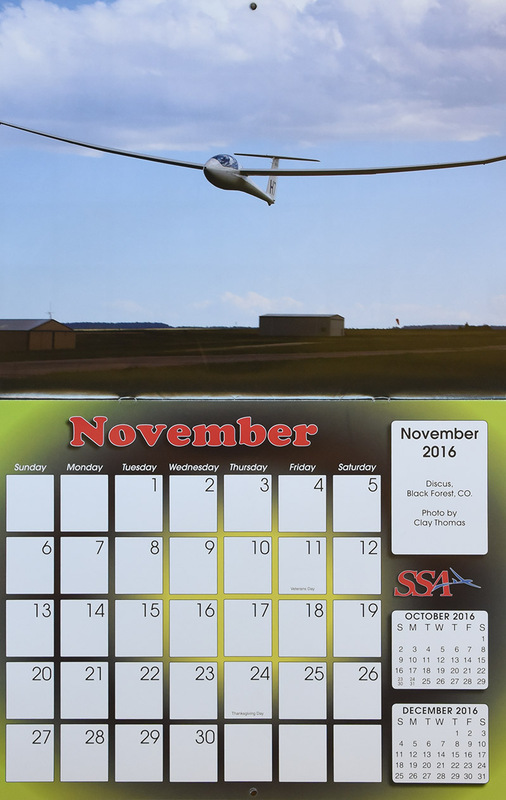 The 2016 SSA Calendar is custom-designed with spectacular full color photos of sailplanes from photographers spanning the globe. Monthly grids feature plenty of space to write notes, make appointments and keep special occasions. Makes a great gift! Discount for quantity purchases - If you purchase 3 or more you will be charged $13.95 each rather than $15.95 each. 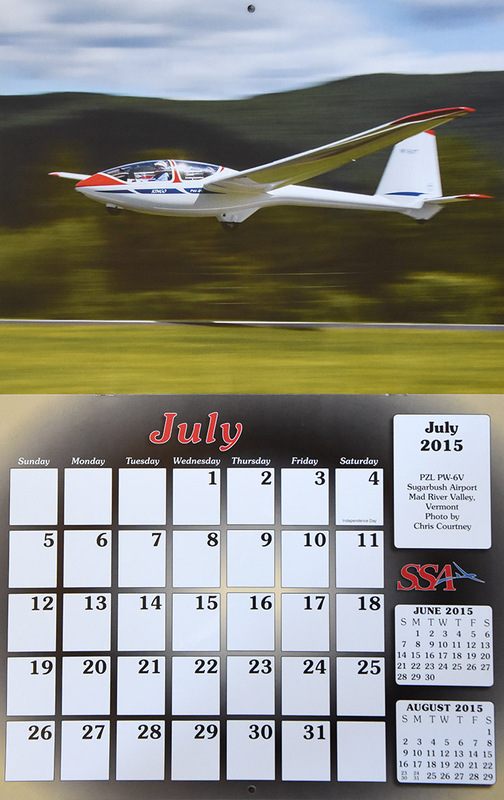 Sale: These calendars are almost out of date, but the photos are still awesome. 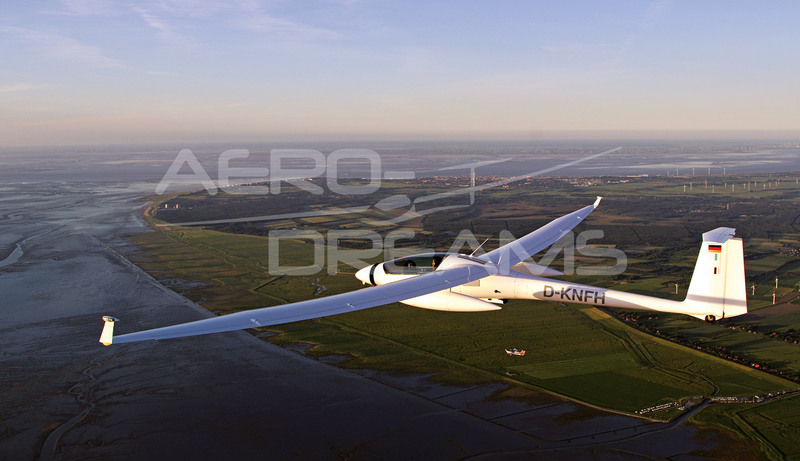 The photographs look great on your home or office wall. I have just a few of these remaining in stock. 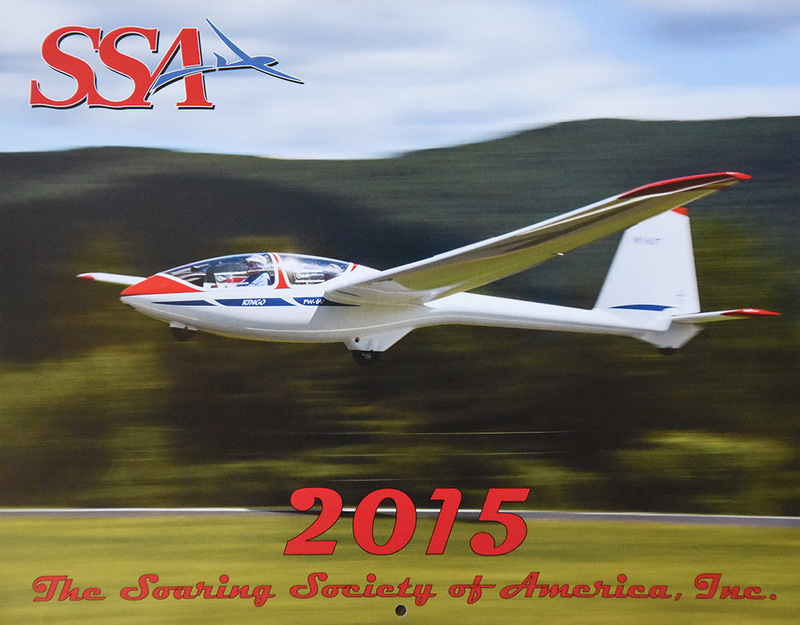 $5 is a great deal for 13 very nice soaring posters. 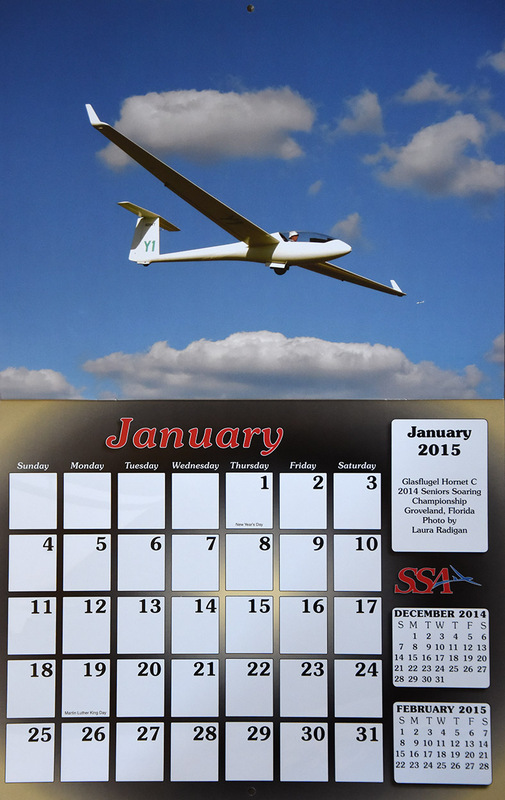 The 2015 SSA Calendar is custom-designed with spectacular full color photos of sailplanes from photographers spanning the globe. 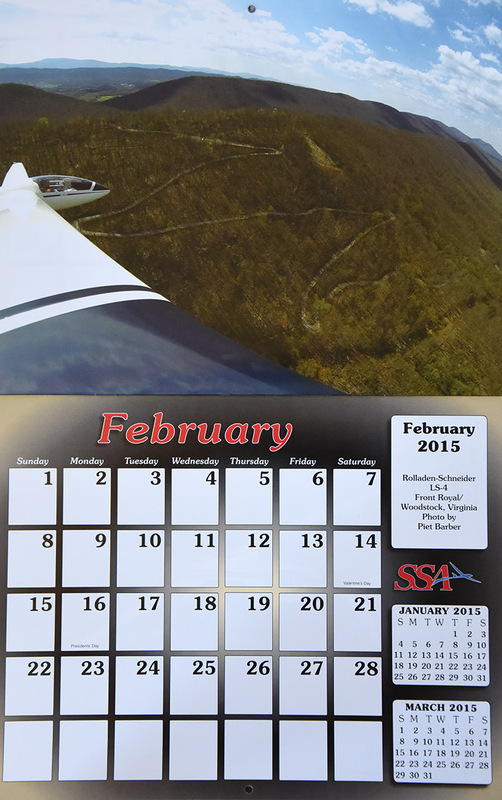 Monthly grids feature plenty of space to write notes, make appointments and keep special occasions. Makes a great gift! 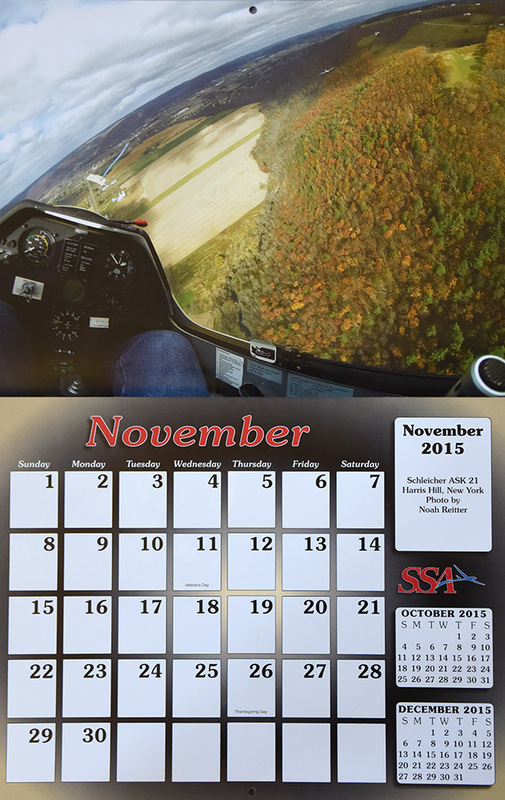 Sale: These calendars are almost out of date, but the photos are still awesome. 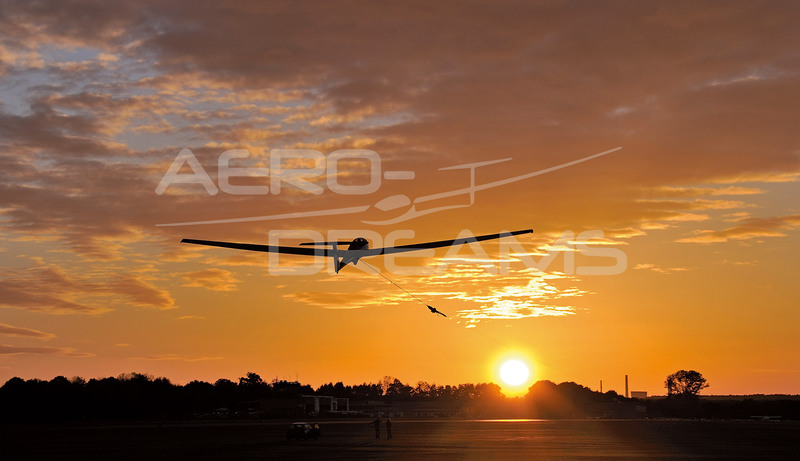 but the photographs can be cut-out and look great on your home or office wall. I have just a few of these remaining in stock. 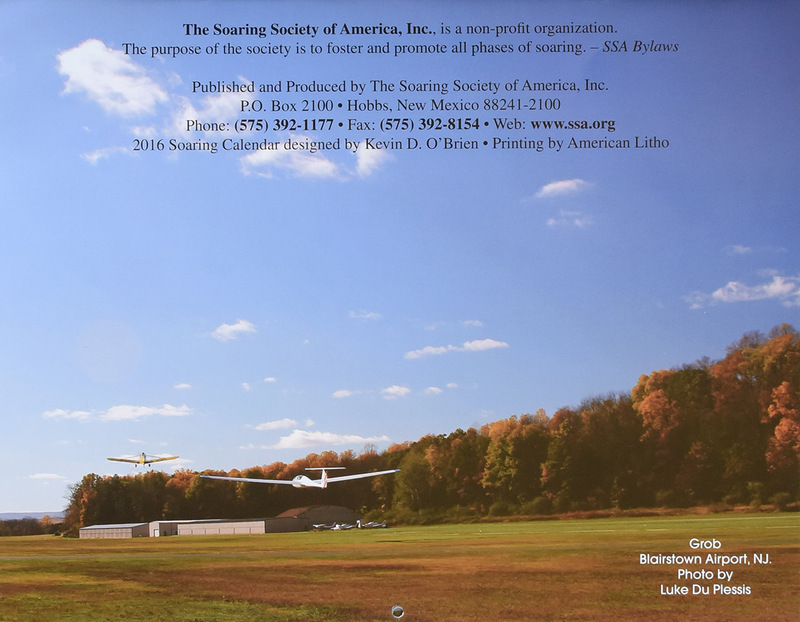 $5 is a great deal for 13 very nice soaring posters. 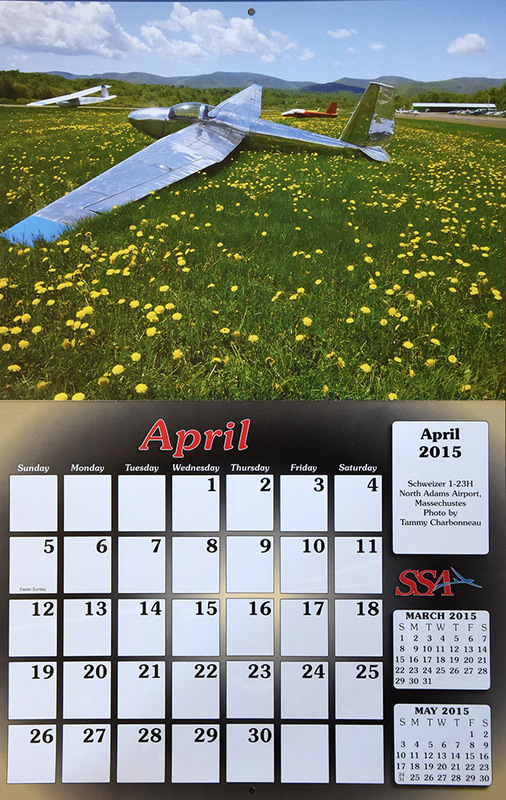 The 2014 SSA Calendar is custom-designed with spectacular full color photos of sailplanes from photographers spanning the globe. 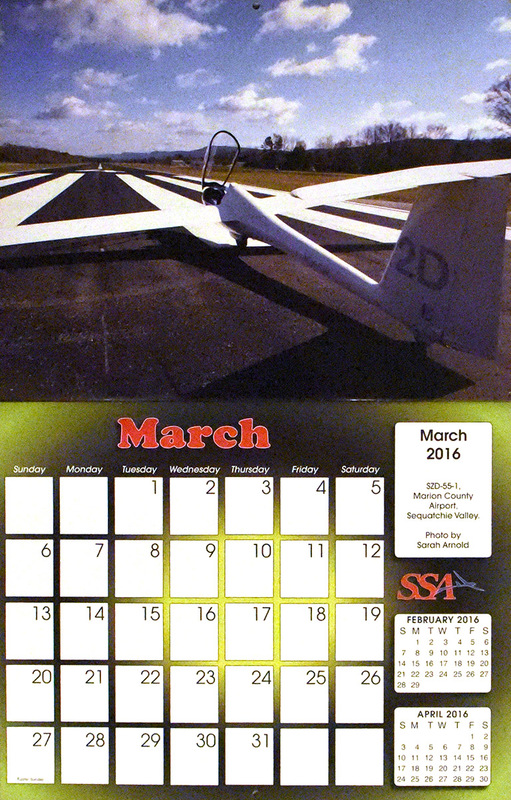 Monthly grids feature plenty of space to write notes, make appointments and keep special occasions. Makes a great gift! 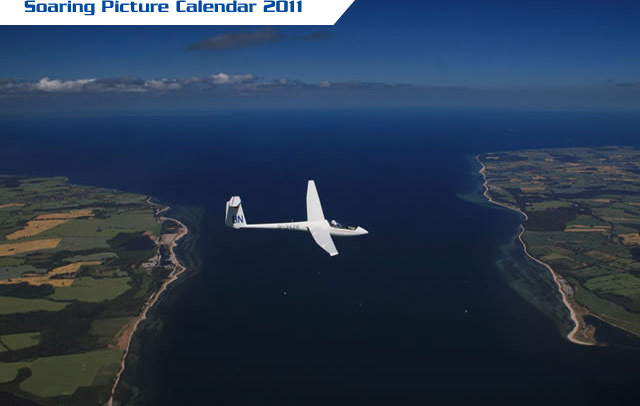 Sale: The calendar is out of date, but the photographs can be cut-out and look great on your home or office wall. 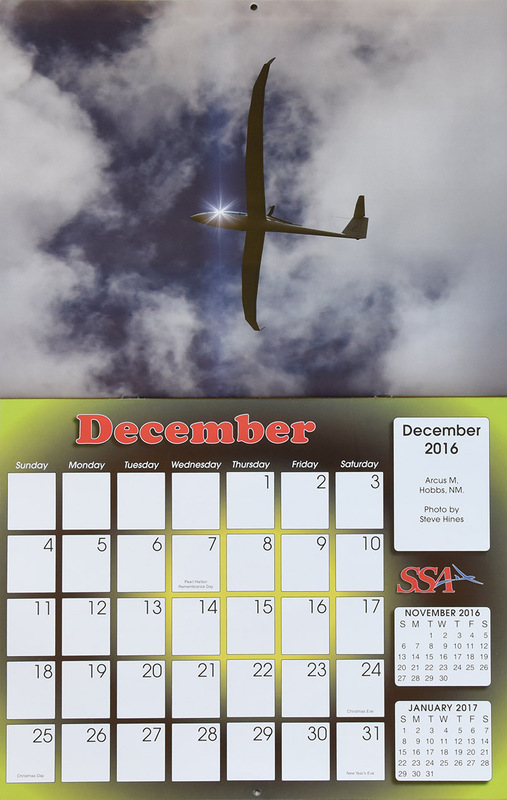 The 2012 SSA Calendar is custom-designed with spectacular full color photos of sailplanes from photographers spanning the globe. Monthly grids feature plenty of space to write notes, make appointments and keep special occasions. Makes a great gift! Discount on quantity purchases. 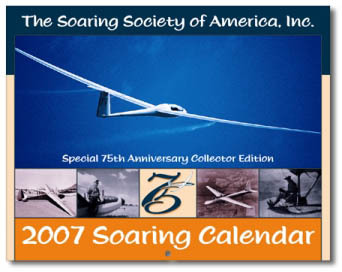 If you purchase 2 or more you will be charged $8.95 each rather than $12.95 each. The discount will be applied when the order is entered into my accounting software. 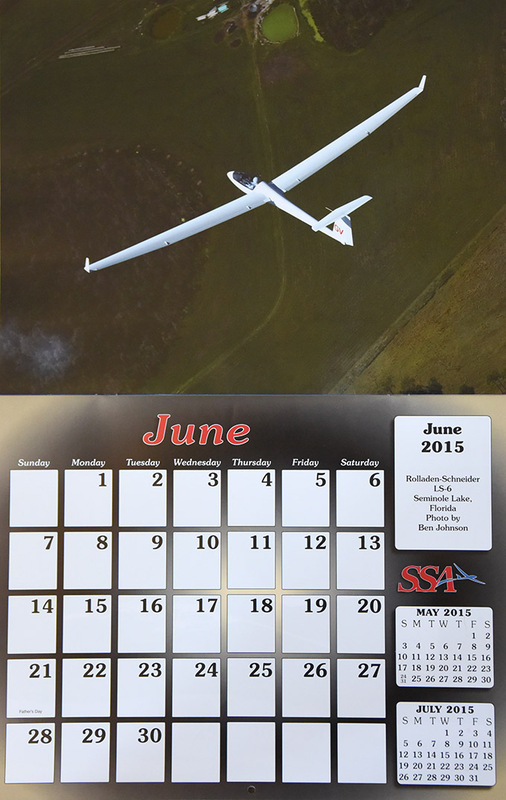 The 2011 SSA Calendar is custom-designed with spectacular full color photos of sailplanes from photographers spanning the globe. Monthly grids feature plenty of space to write notes, make appointments and keep special occasions. Makes a great gift! 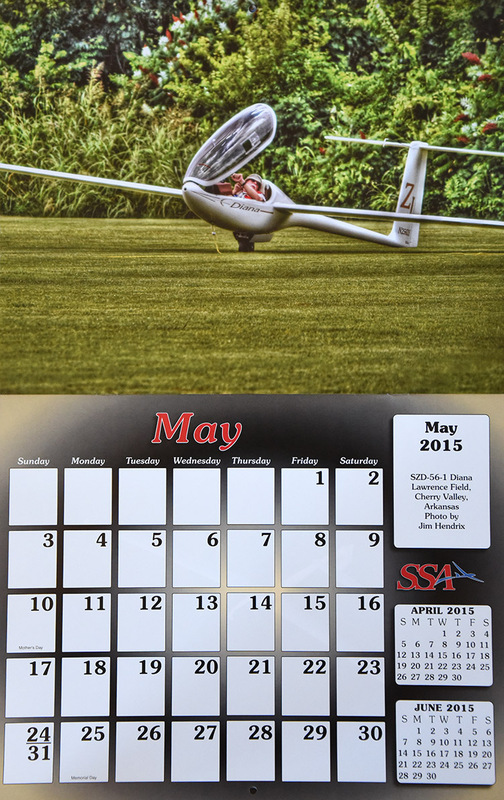 The 2010 SSA Calendar is custom-designed with spectacular full color photos of sailplanes from photographers spanning the globe. 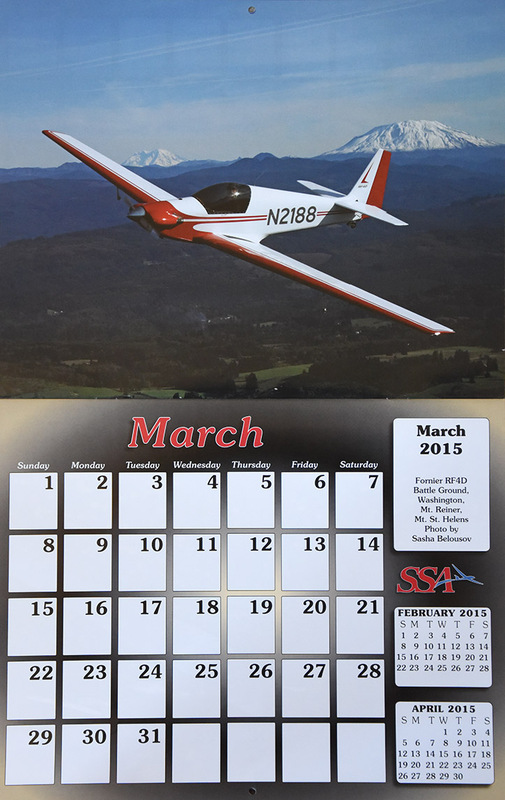 Monthly grids feature plenty of space to write notes, make appointments and keep special occasions. Makes a great gift! The 2009 SSA Calendar is custom-designed with spectacular full color photos of sailplanes from photographers spanning the globe. 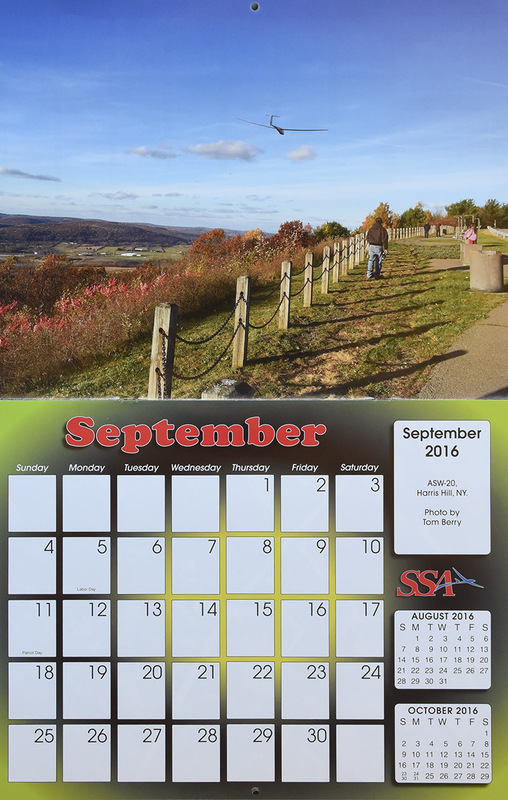 Monthly grids feature plenty of space to write notes, make appointments and keep special occasions. Makes a great gift! 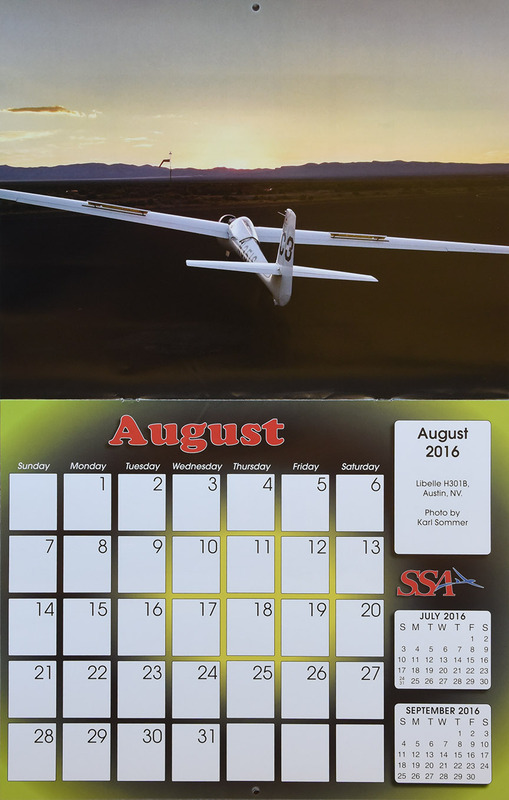 The 2007 SSA Calendar is custom-designed with spectacular full color photos of sailplanes from photographers spanning the globe. 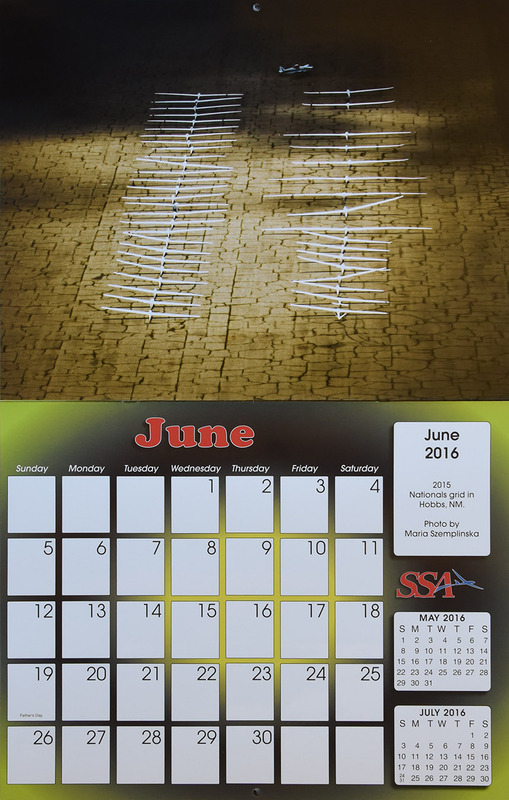 Monthly grids feature plenty of space to write notes, make appointments and keep special occasions. I'm not sure how I ended up with this extra ring, but I don't need it. 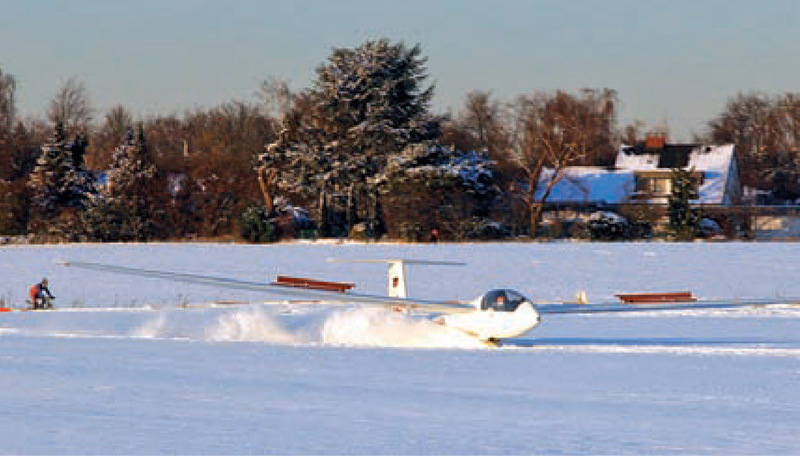 It is designed for use on a standard 57 mm Winter W-5453 variometer (or similar) in knots or ft/min. 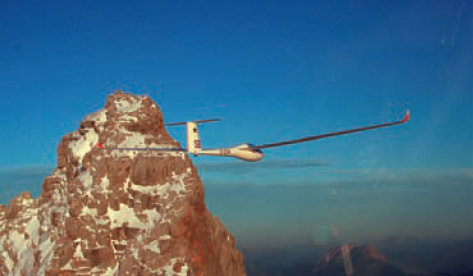 The ring is marked for use with an airspeed indicator that is in units of knots. A ring like this normally sells for $94. I am selling it for $45. 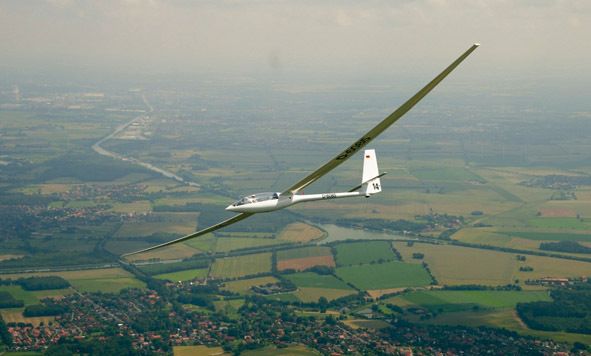 The MacCready type ring is an indispensable aid in cross-country soaring. The ring is rotatable and is marked with speeds and a white triangle. 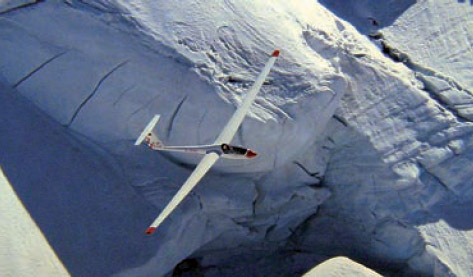 The chief use of the MacCready ring is to achieve the highest possible cruising speed (average cross-country flying speed) on thermal cross-country flights. 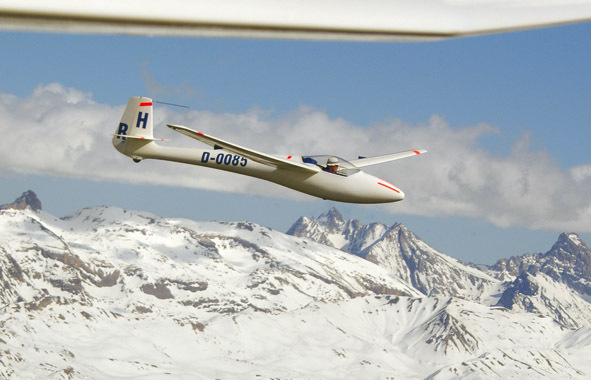 This involves setting the white arrow to the anticipated rate of climb for the next thermal. 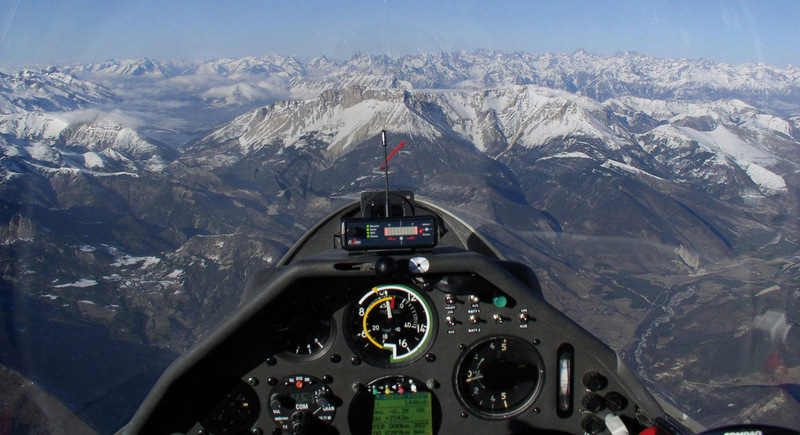 Optimum flight performance is assured when the airspeed indicated by the airspeed indicator corresponds to the preselected flying speed to which the MacCready ring has been set. 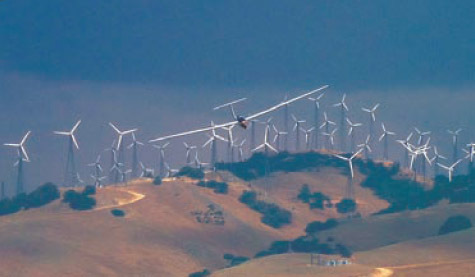 The MacCready ring allows gliding distance and final approach to be optimized. Please refer to relevant literature for further details. 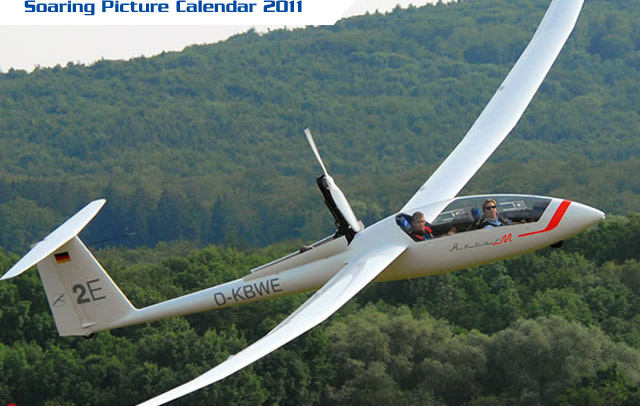 When ordering, please do not forget to state the type of aircraft in which the ring will be used. 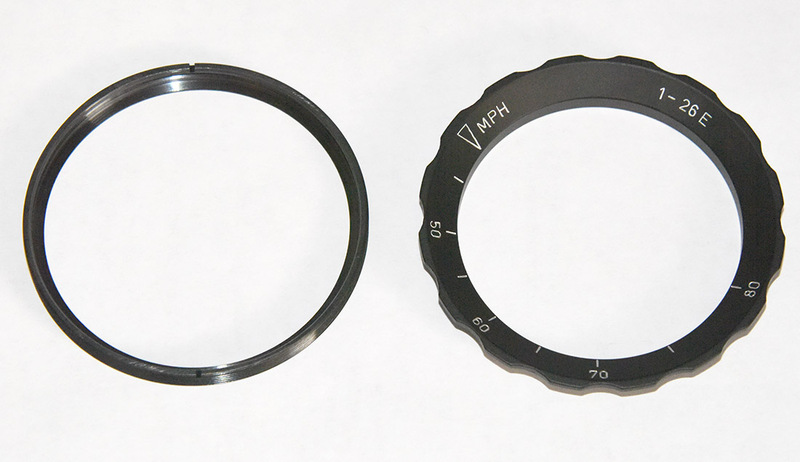 If the ring is retrofitted to a variometer of older design, the original threaded ring of the instrument must be removed and replaced by a grooved threaded ring onto which the MacCready ring can be fixed with ease. I'm not sure how I ended up with this extra ring, but I don't need it. 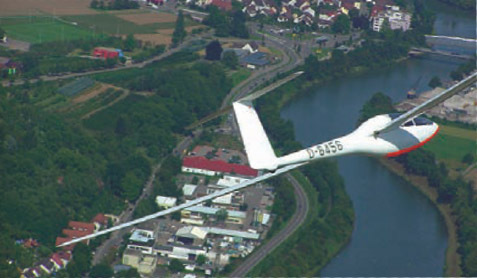 It is designed for use on a standard 57 mm Winter W-5453 variometer (or similar) in knots or ft/min. 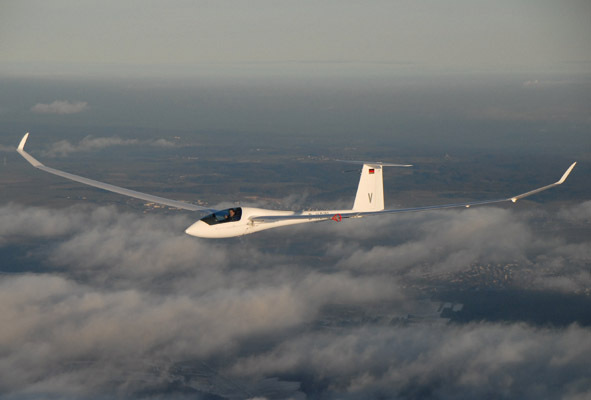 The ring is marked for use with an airspeed indicator that is in units of knots. A ring like this normally sells for $105. I am selling it for $45. I'm not sure how I ended up with this extra ring, but I don't need it. 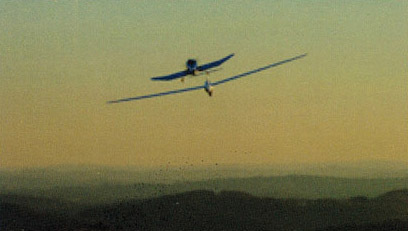 It is designed for use on a standard 80 mm Winter W-6423 airspeed indicator (or similar) in knots. A bezel ring is not included. A set like this normally sells for $170. I am selling it for $50. 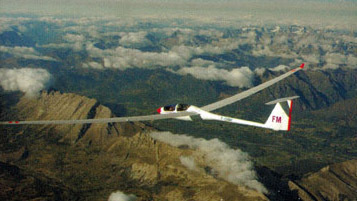 As is generally known, wing load and, in turn, the optimum flap positions for the varios speed ranges of a variable-flap glider changes with take-of weight. 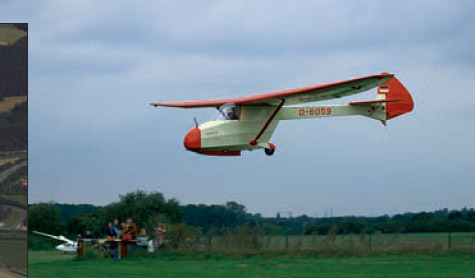 Until now, selecting the right flap position has involved using special tables carried on board or observing a confusingly large number of marks on the airspeed indicator. 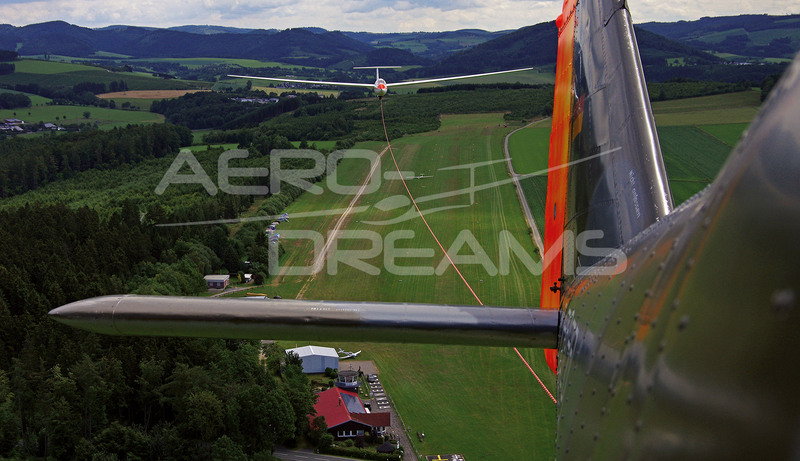 The new adjustable ring for airspeed indicators makes these complicated methods things of the past. 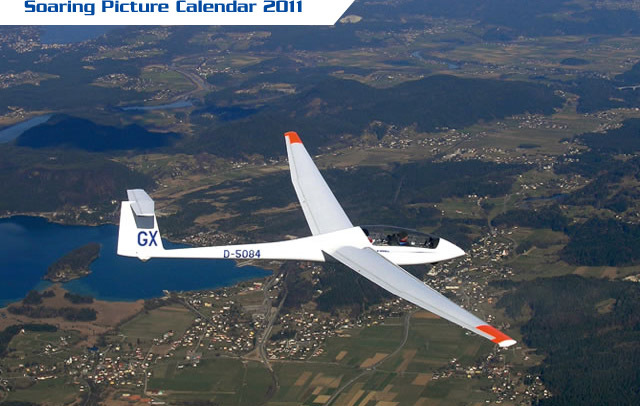 As the illustration shows, the ring has a double scale for aircraft weight "G": and wing loading "G/F". 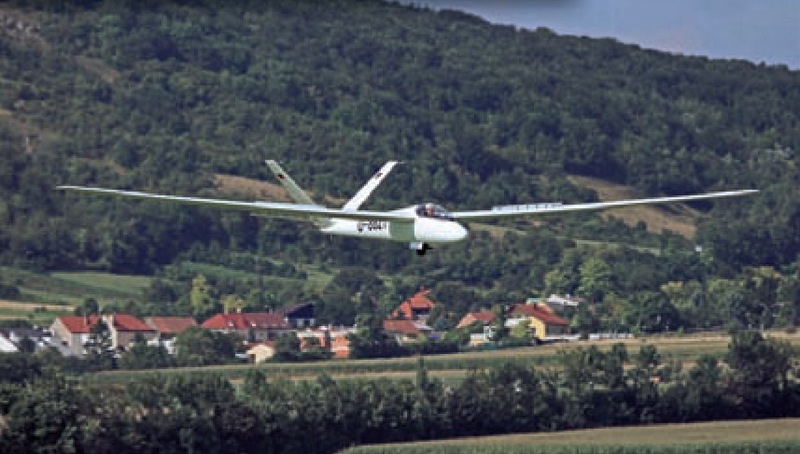 Four arrows can also be seen, showing the corresponding angles for the flap positions. 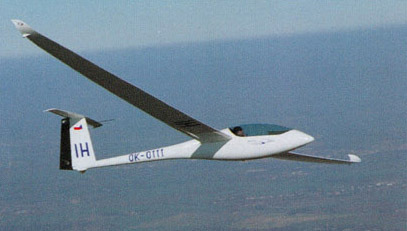 The number of arrows depends on the number of flap positions for the type of glider in question. 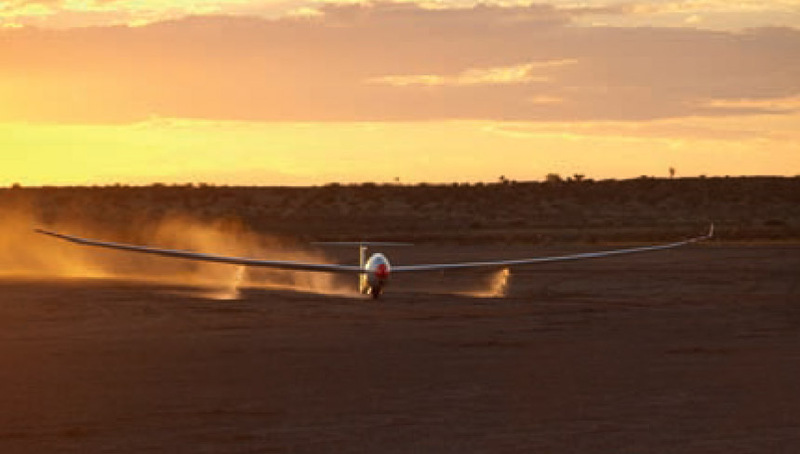 Like the MacCready ring of the variometer, the rotatable ring is simply push-fitted onto the airspeed indicator. 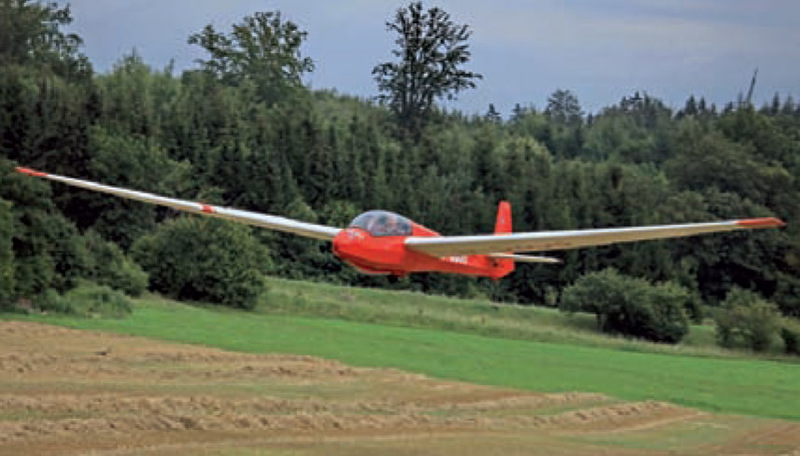 One the take-off weight has been calculated by adding the empty weight of the aircraft, the weight of the pilot and the weight of any water ballast on board, the "G" scale is simply turned until this figure is aligned with the 0 mark on the airspeed indicator. 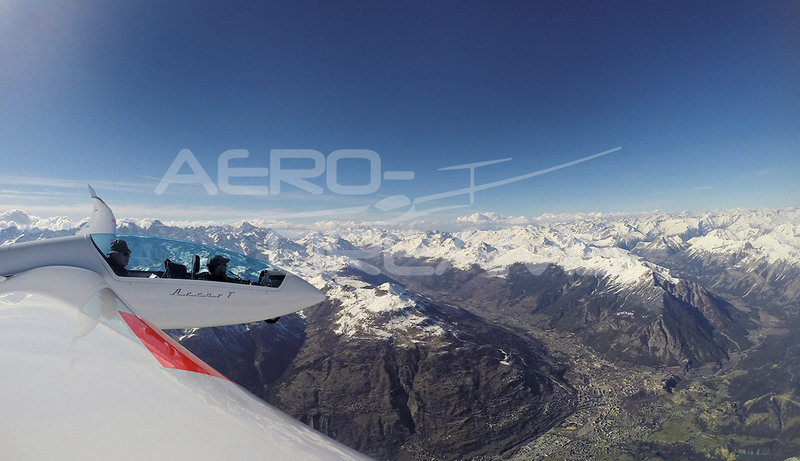 The arrows on the ring now automatically show the correct flap positions on the airspeed indicator scale. 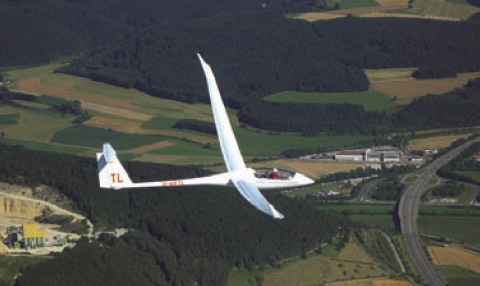 Furthermore, the correct wing load for the take-off weight can be read from the "G/F" scale and entered in an electronic variometer or flight computer, if fitted. 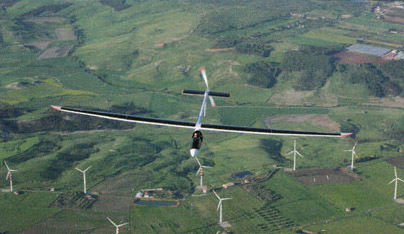 If wing load changes in the course of the flight, due to a reduction in ballast, for example, the ring need only be turned back to the new flying weight, and immediately, the arrows show the new, flight-dependent flap positions. 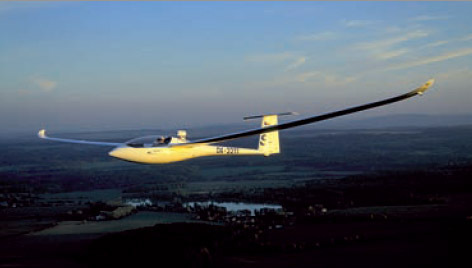 The ring is calibrated for a standard preset acceleration of 1 g. If values as high as 1.2 g should occur, as they do in high-performance competition gliding, a second ring with the appropriate values can be fitted during the flight, or changed as required. 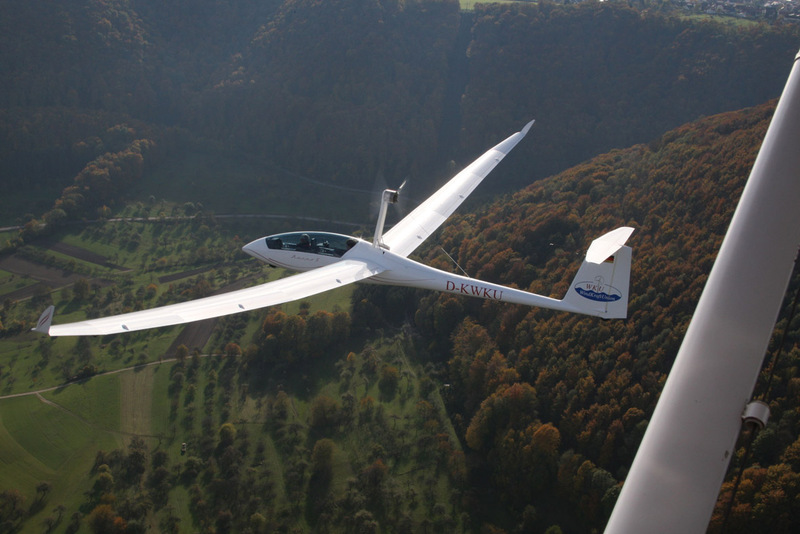 If the Großkinsky ring is not ordered along with a new airspeed indicator, please send us the airspeed indicator and state the type of aircraft in which it is installed, because the scales vary from model to model. 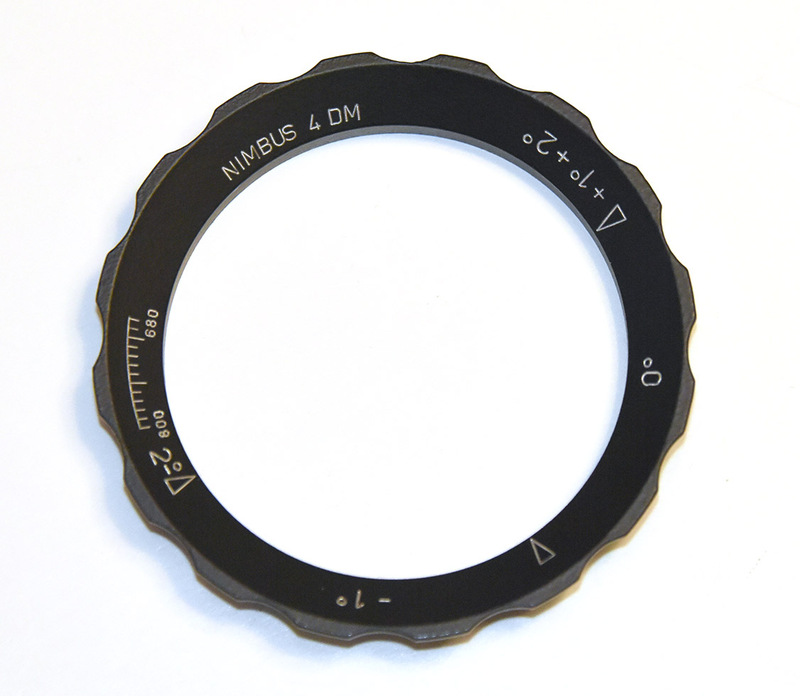 Only the 6 FMS 4 or 7 FMS 4 series airspeed indicators with 510° scales are suitable. 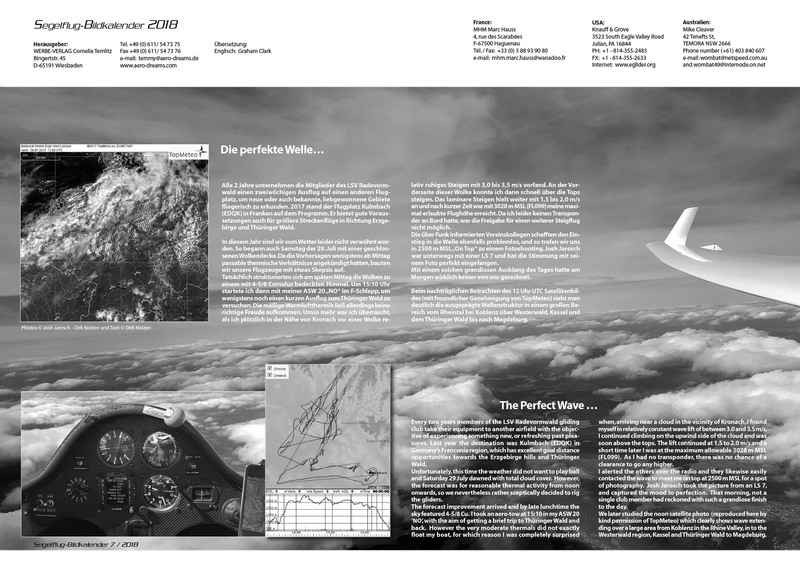 Note: Airspeed indicator not included.